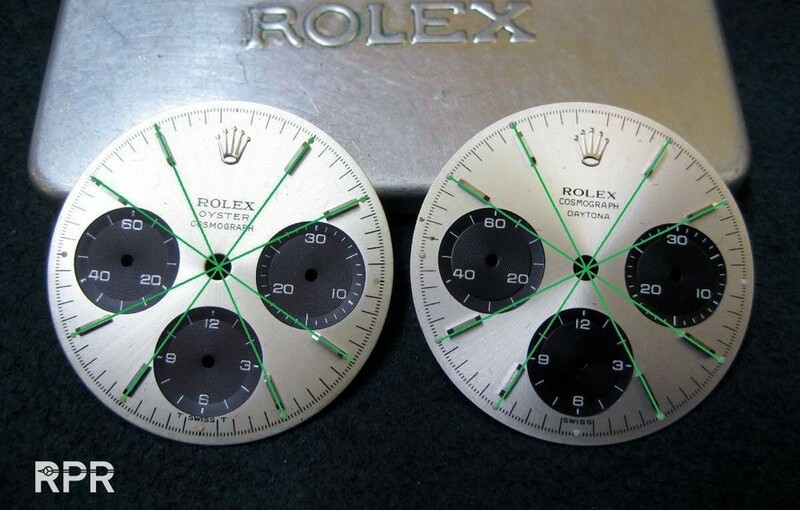 The definitive introduction of the screw down pushers gives Rolex a great advantage over its competitors. 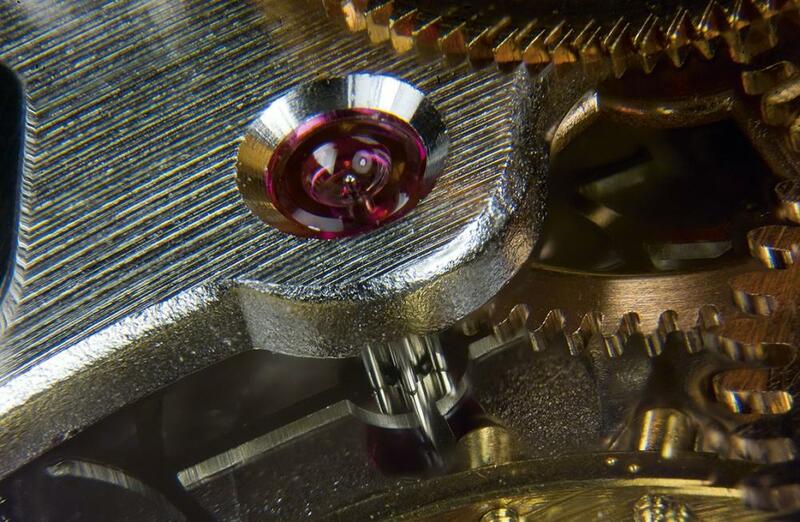 This feature allows the watch to be submerged even though the chronographic functions are disabled because of the screwed-down position of the pushers. 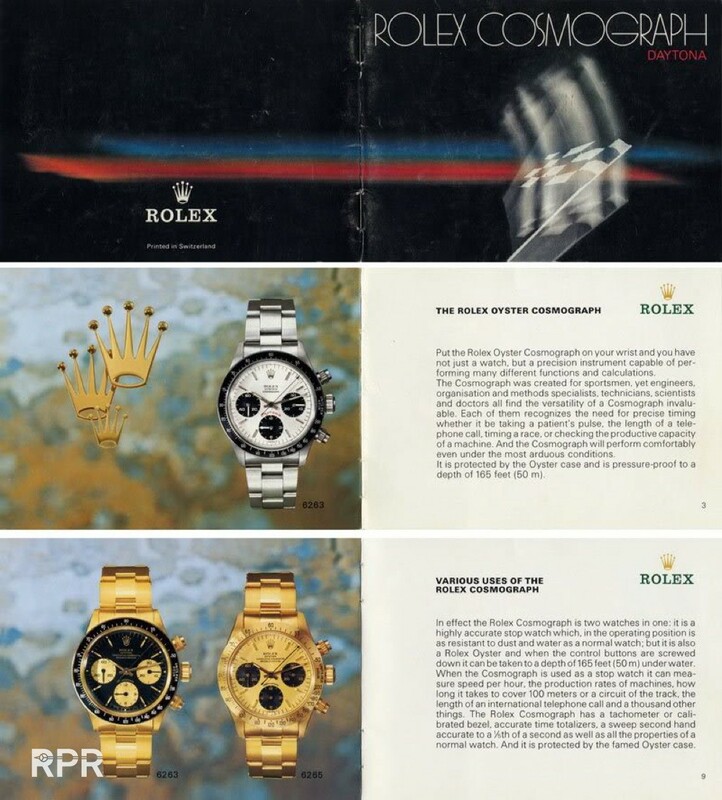 This attracts buyers who flock to buy the Rolex Chronographs worldwide, thus, eventually ensuring the success of this model. 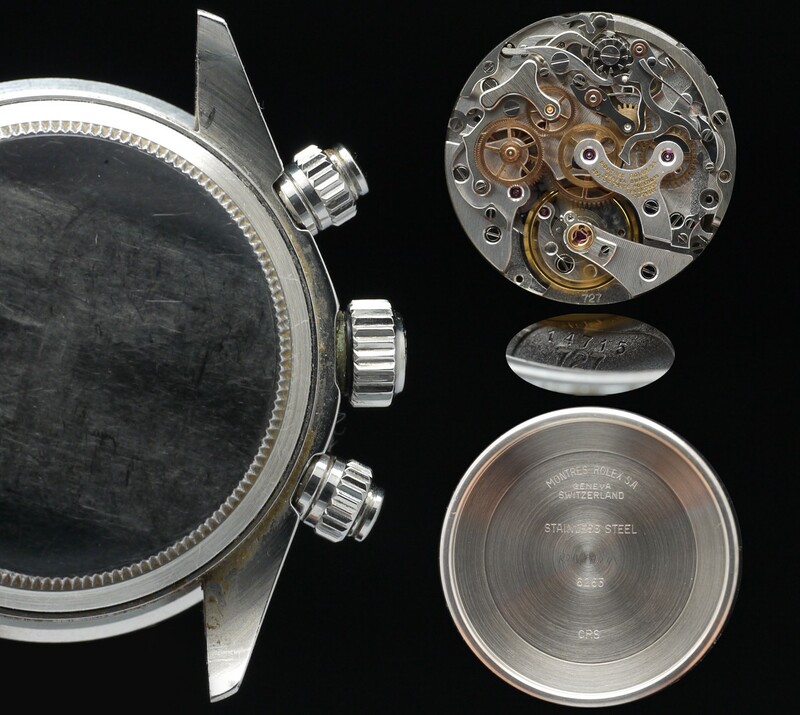 The old-fashioned manually wound timepieces began their journey towards collectors heaven. 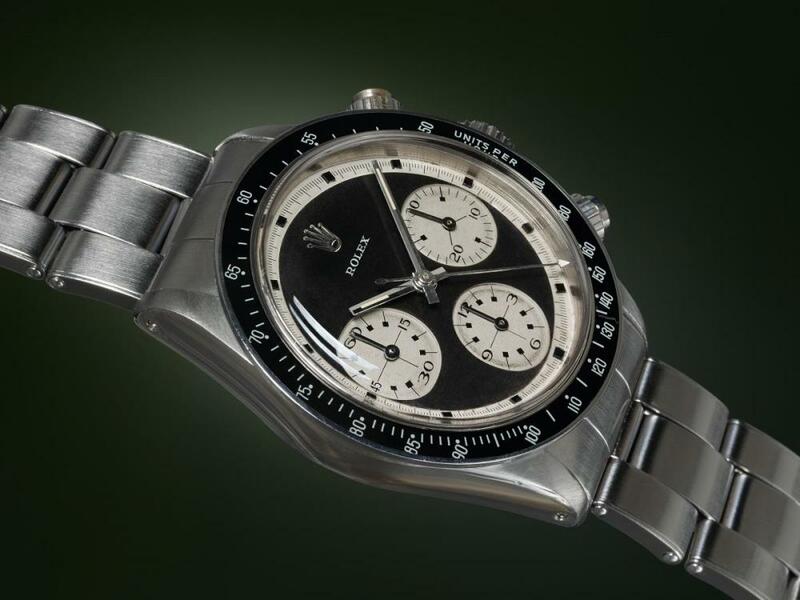 They are soon considered irrefutable treasures to the collectors’ community. 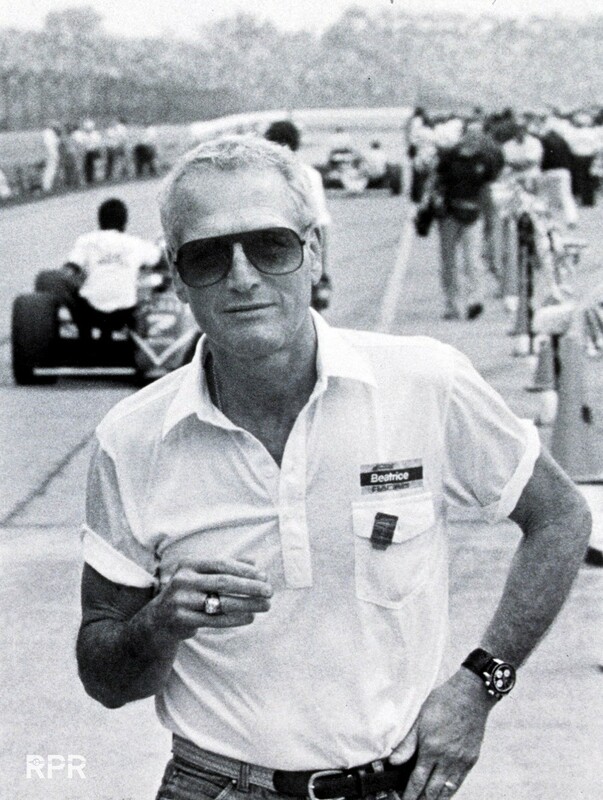 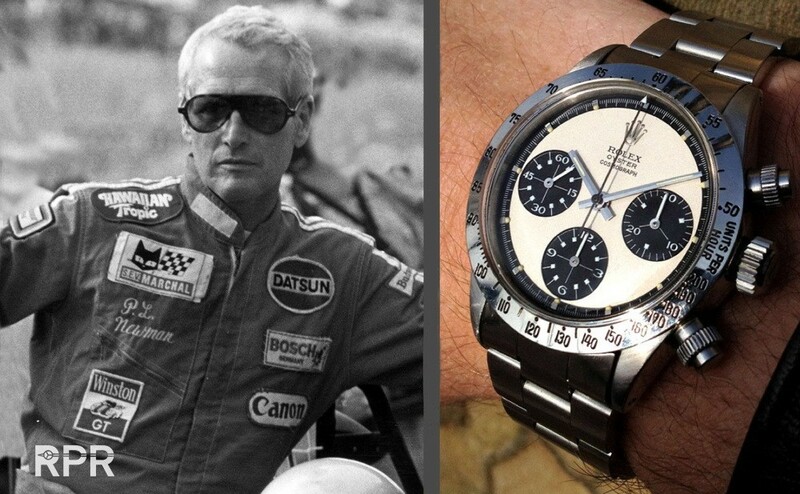 The Paul Newman is a prime example and by the end of the 1980s becomes one of the most interesting case studies of the vintage watch market. 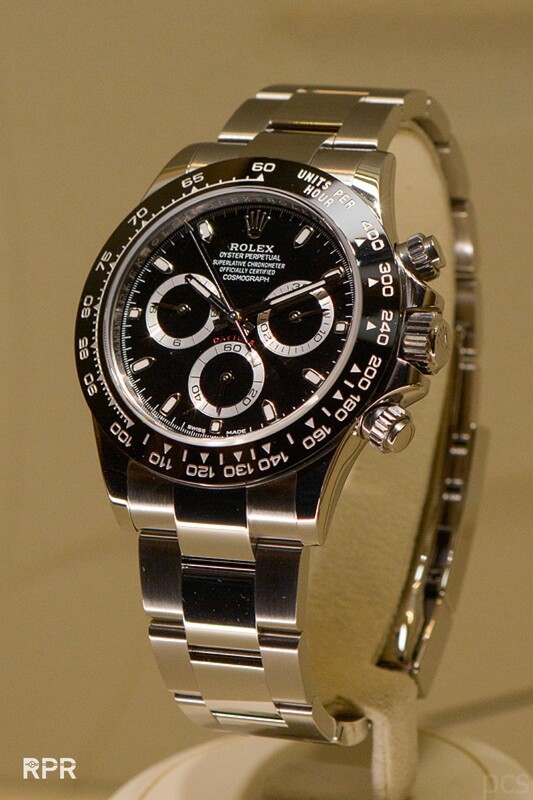 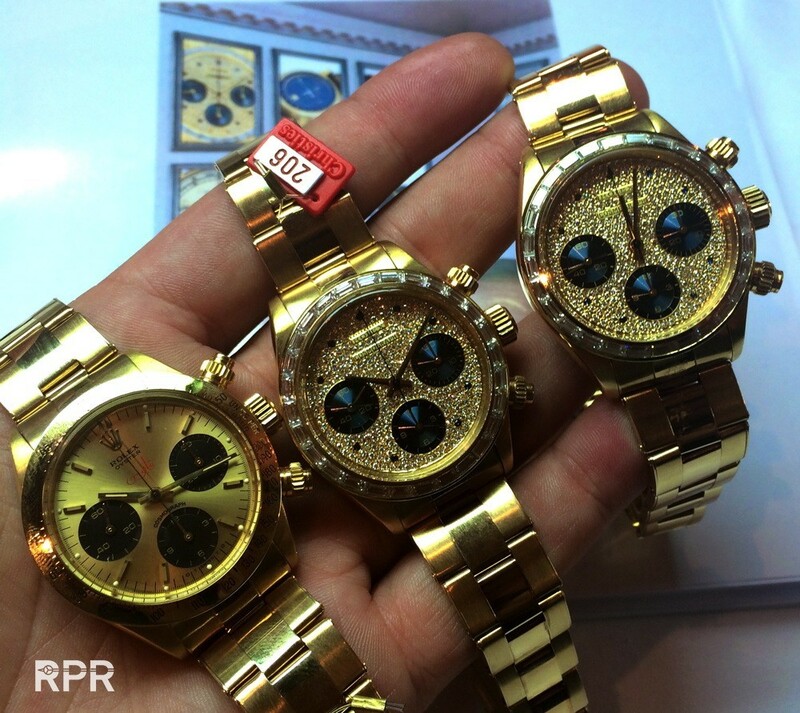 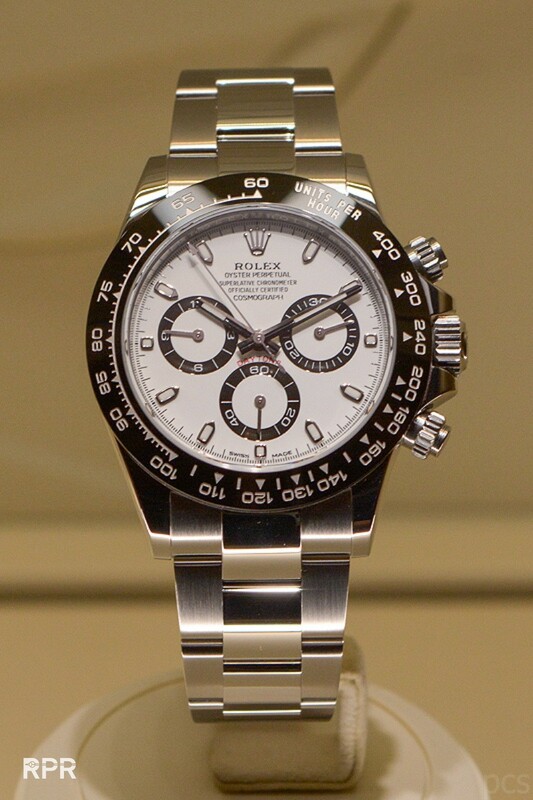 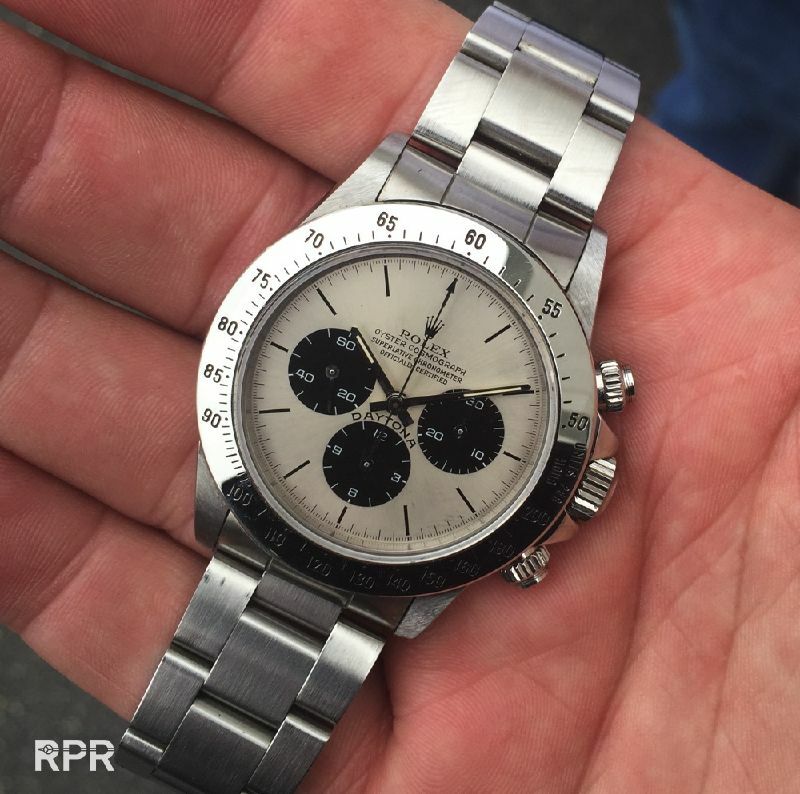 A handful of Rolex history..
Sigma Rolex Daytona Ref 6263.. 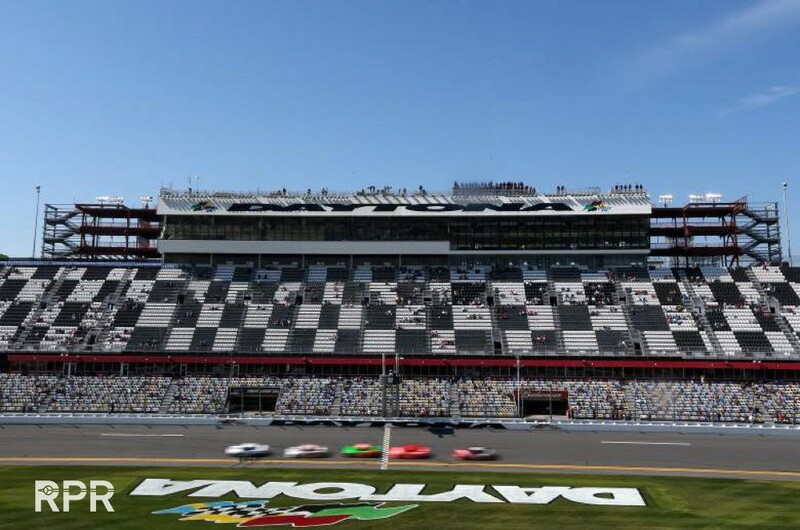 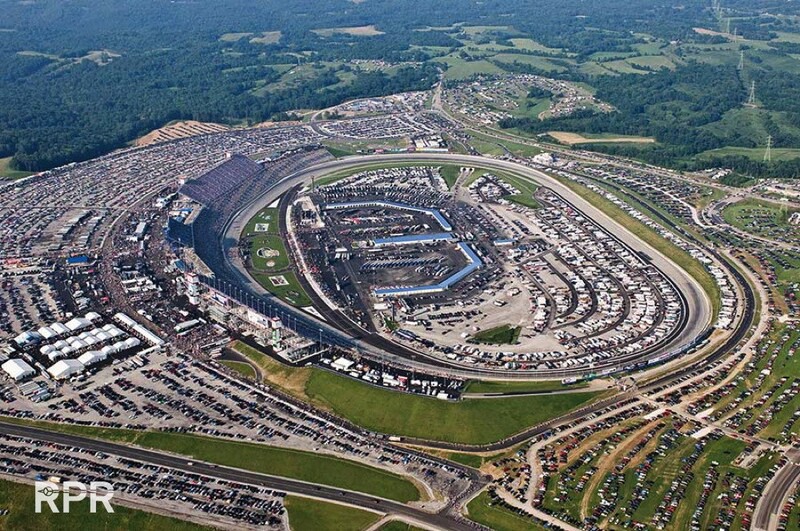 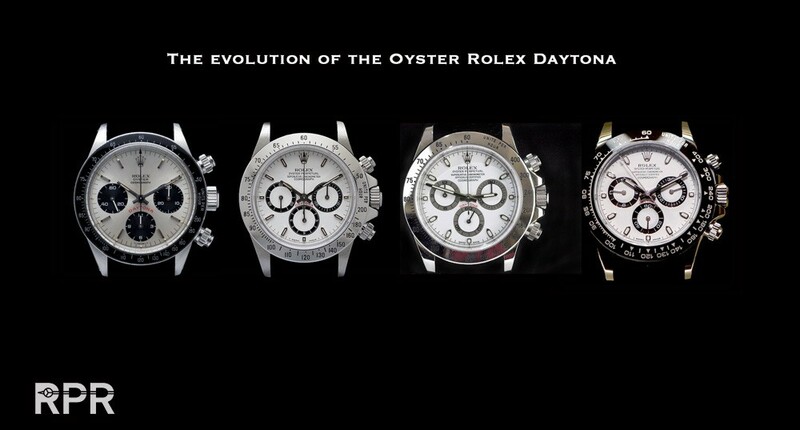 Tropical Daytona’s. 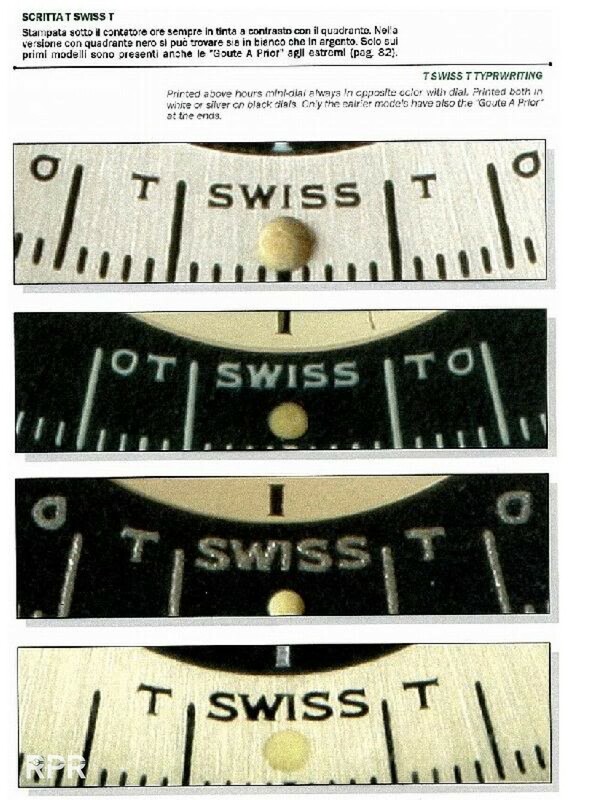 From original black the sub dials or even the whole dial changed it’s color to brown. 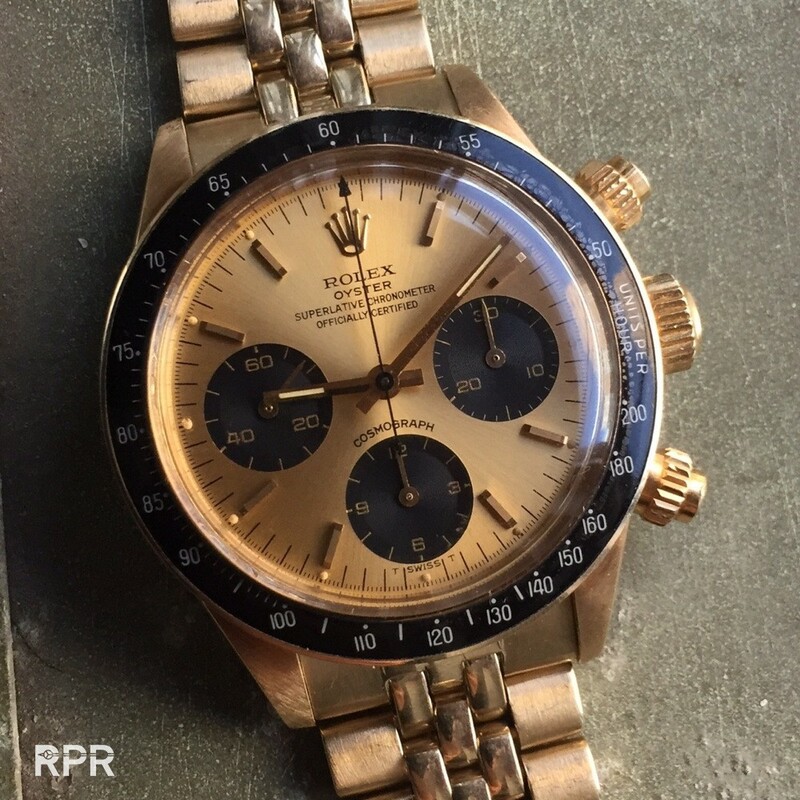 The sub dials turned to a very attractive light color brown..
And here we see with this rare Oyster Paul Newman the outside track changed from black to dark brown..
Big sub dials vs regular sub dials on the left. 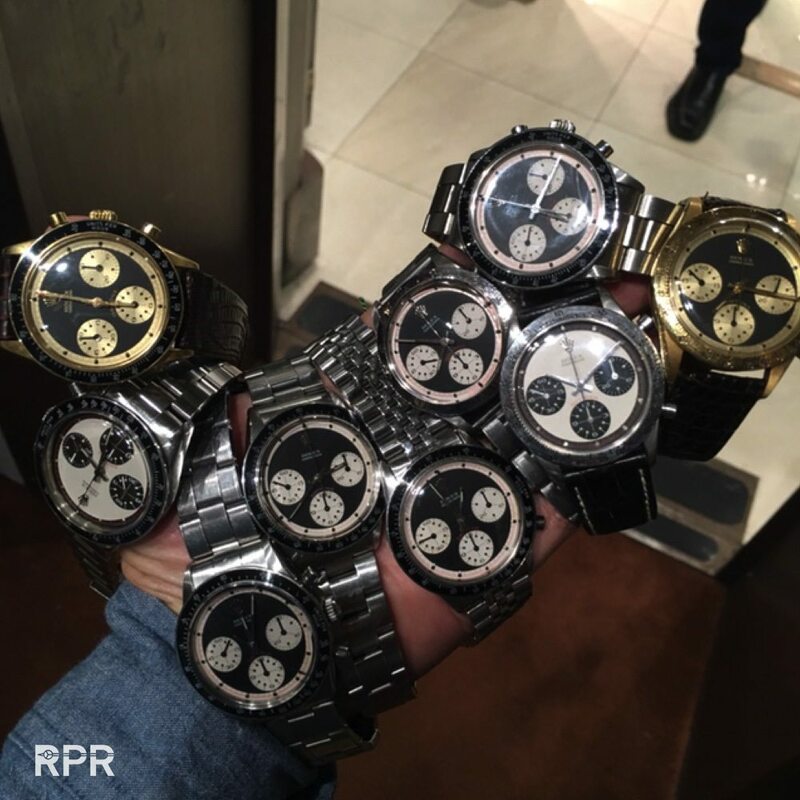 The bigger version is called by collectors: “Big Eye”..
18K Rolex Daytona Ref 6263 “Big Eyes Sigma” with French hallmarks, for sale on RPM over here.. 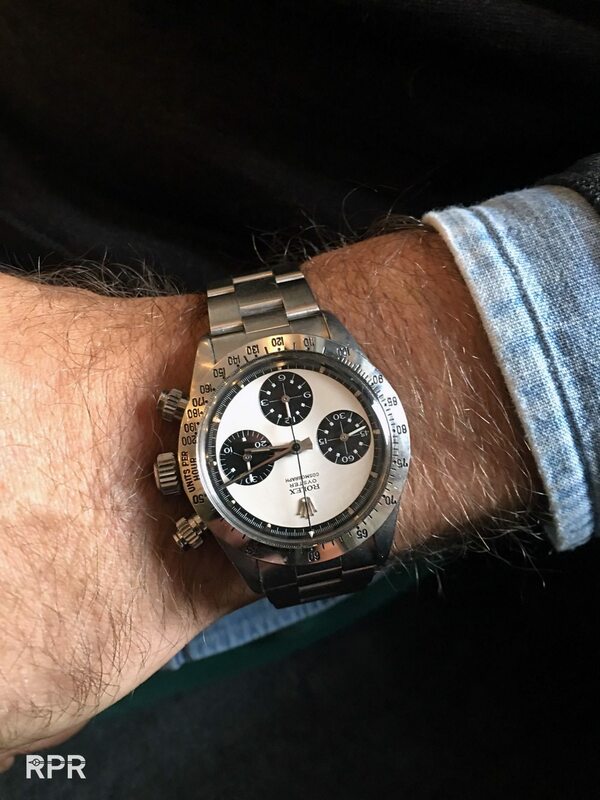 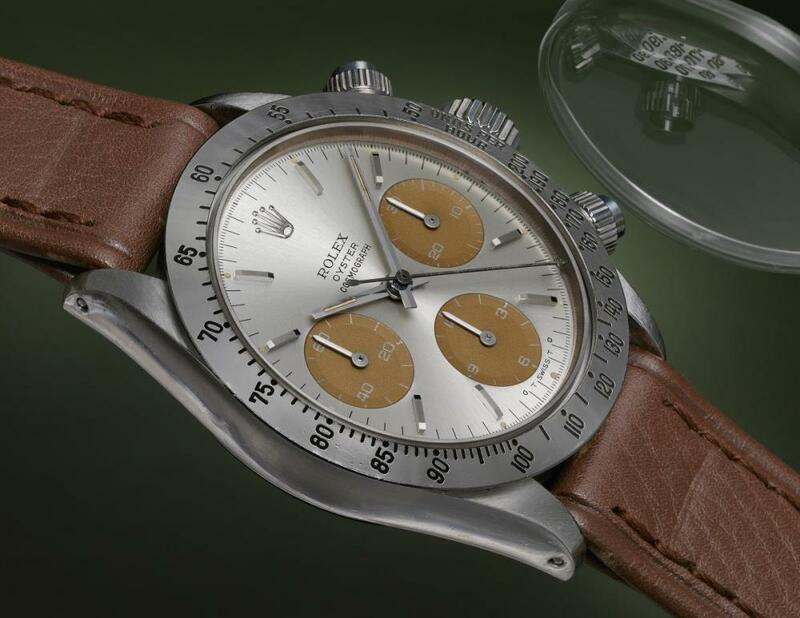 The Paul Newman dial or Exotic dial was introduced by Rolex to push the slow sales of their Daytona end 60-ies. 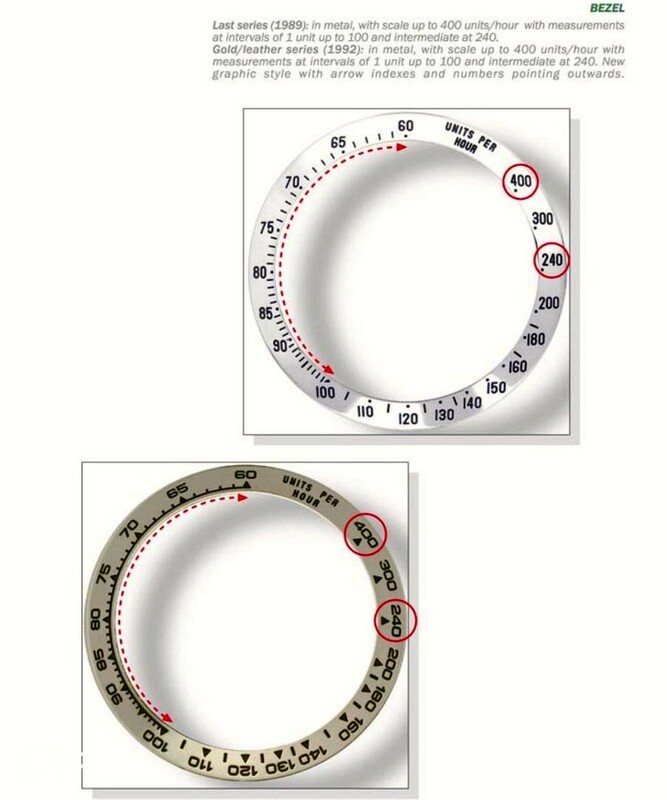 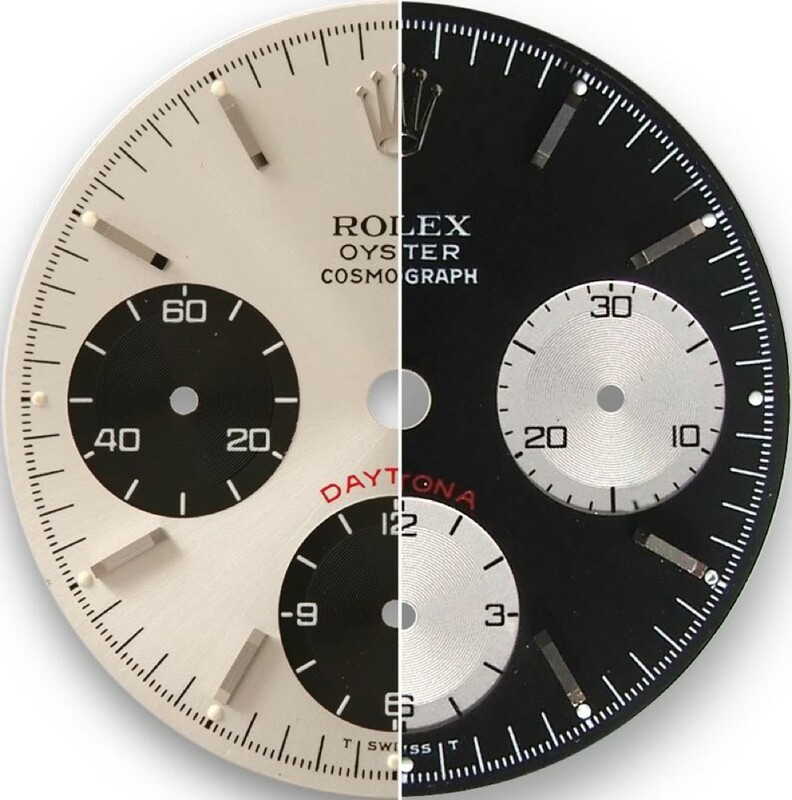 You immediately notice that the PN dial is lighter by color, more white then the silver big red ones. 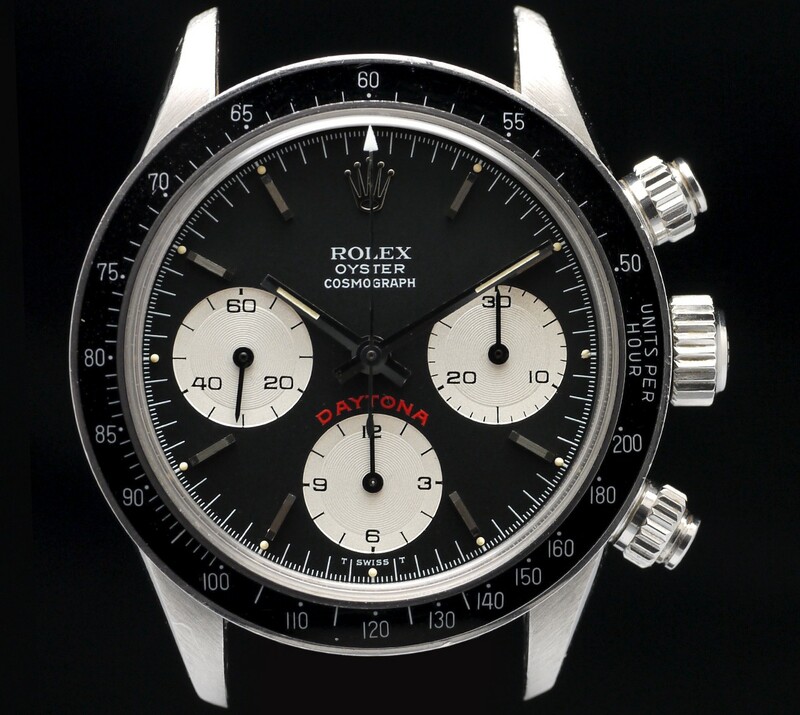 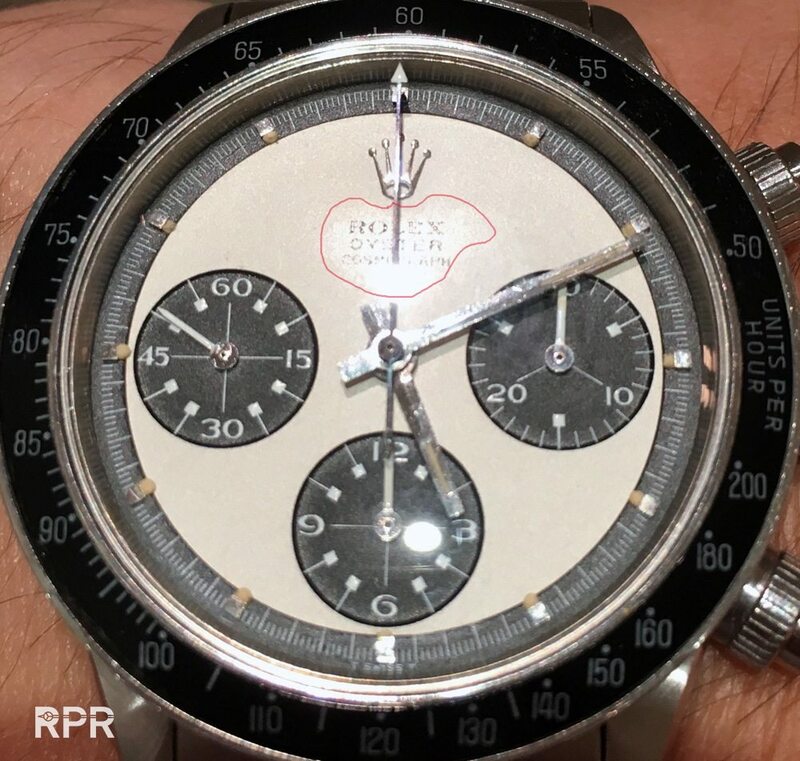 Among the various versions of the Paul Newman Daytona, the model sporting a black background and screw-down pushers called RCO or Oyster Down or in italian Oyster Sotto, becomes the most prestigious and sought-after by collectors all over the world. 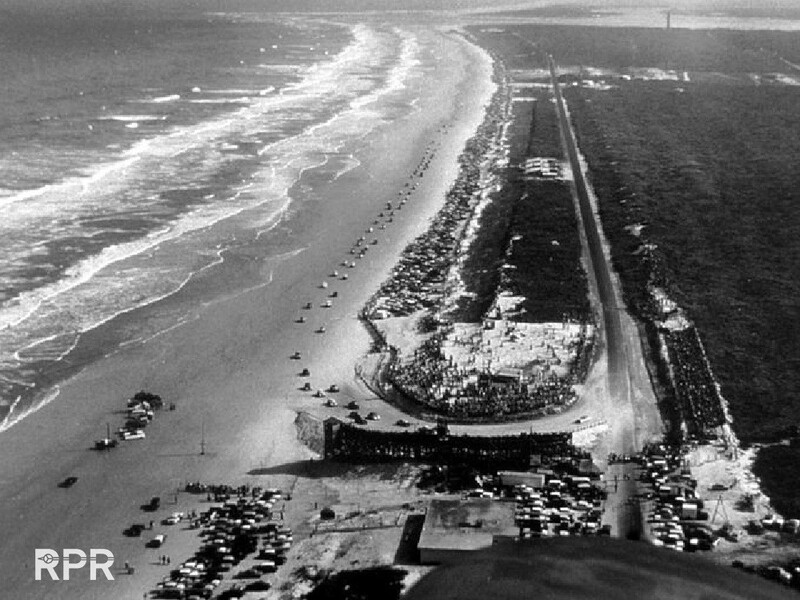 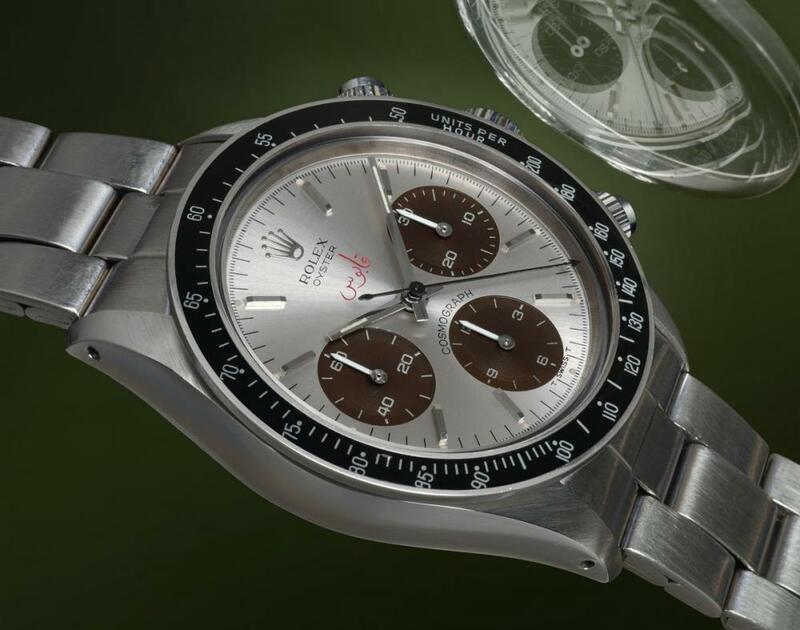 A rough estimate indicates that a little more than a dozen appeared on the market, including both public and private sales, and they all became crowning jewels of the most important international Daytona collections. 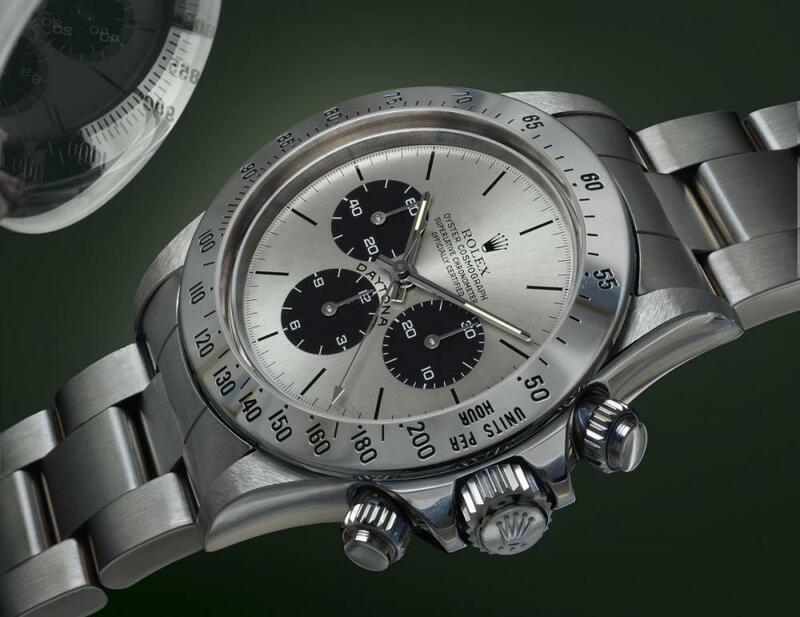 Technically manufactured in a similar way to the latest versions of push-down buttons Daytonas, however the difference lies in the presence of the “Oyster” designation, typical of its reference 6263. 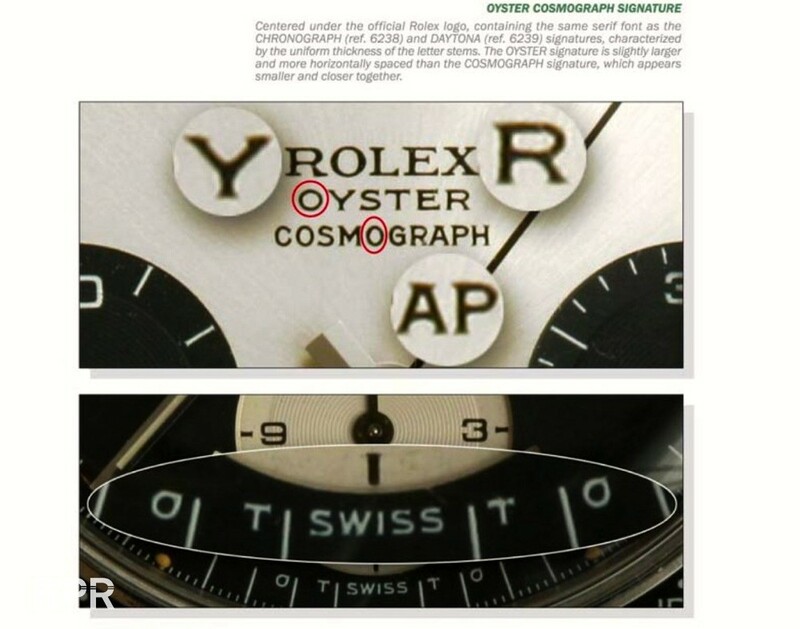 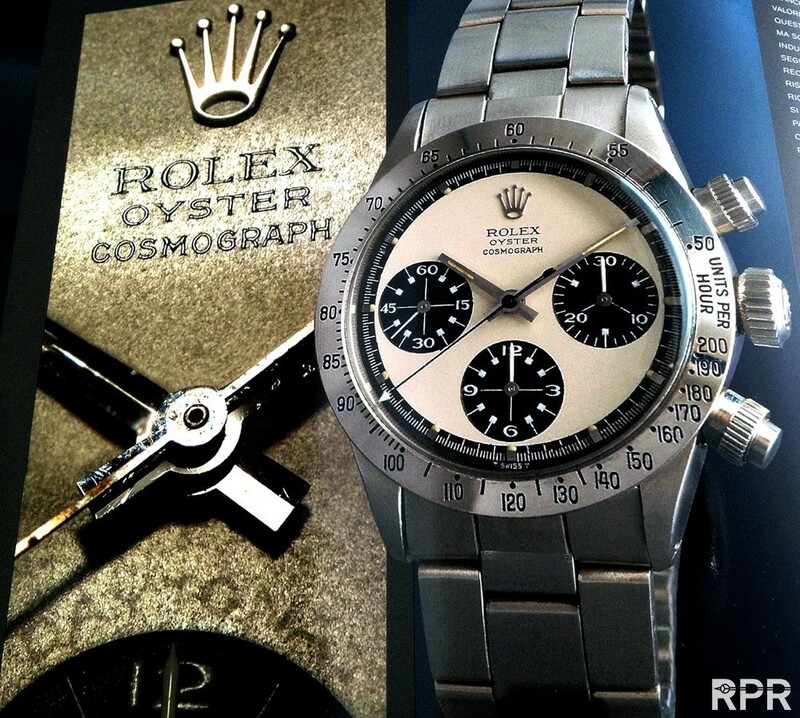 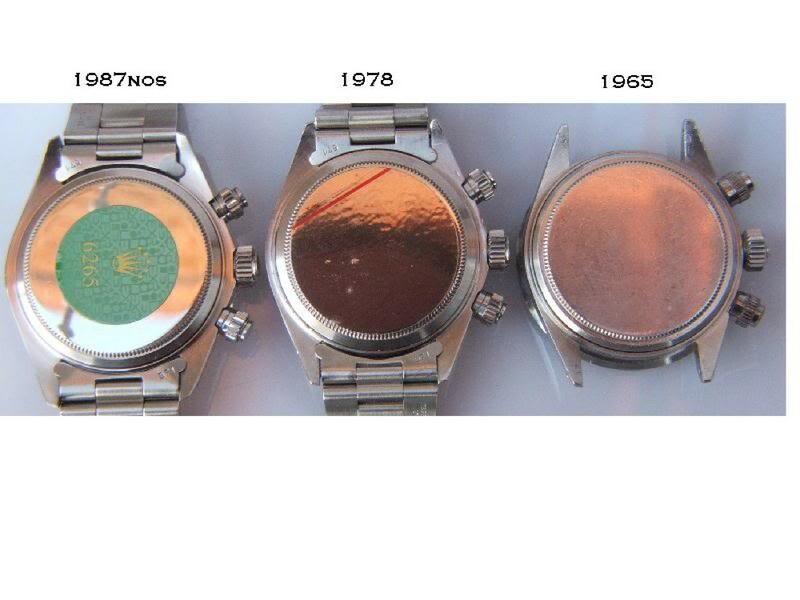 On normal dials, “Oyster” is located always between “Rolex” and “Cosmograph”. 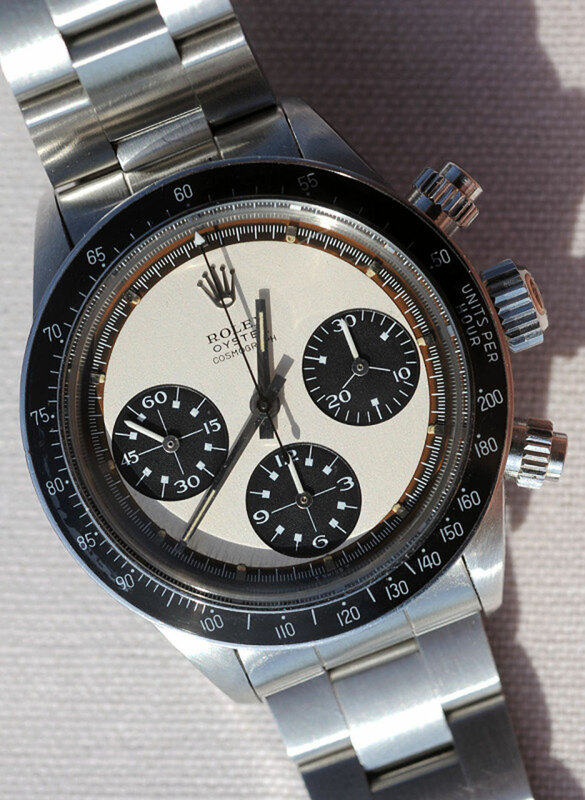 This holds true also for the white Paul Newman dial. 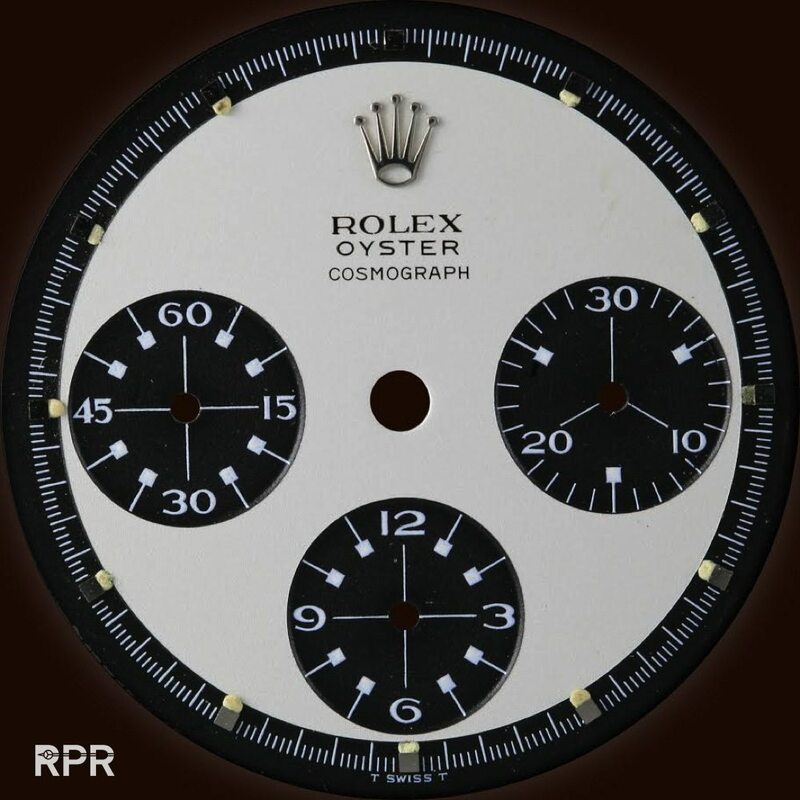 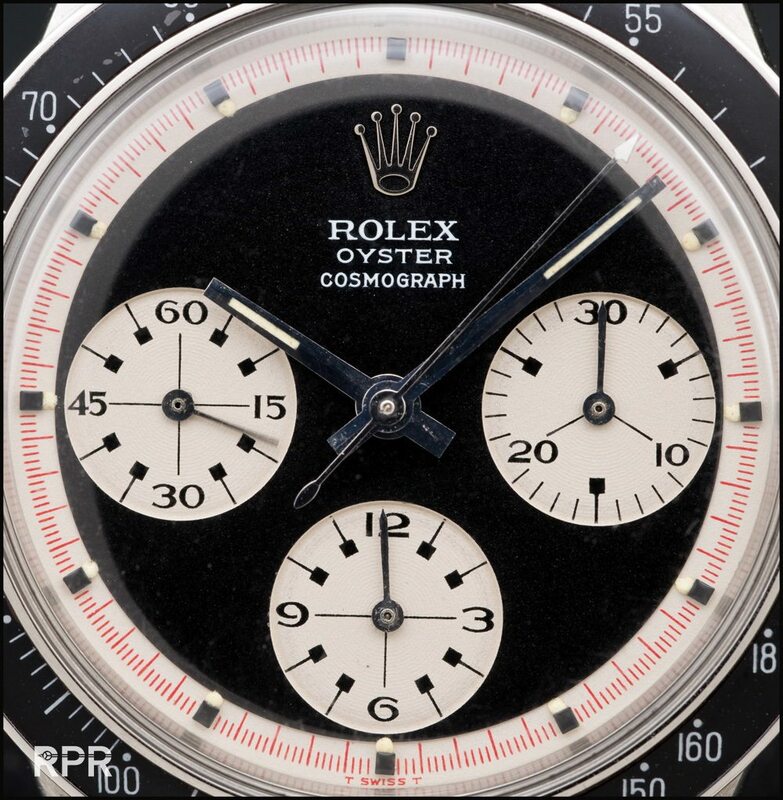 However, on this model the dial reads “Rolex Cosmograph Oyster” instead of the normal “Rolex Oyster Cosmograph”. 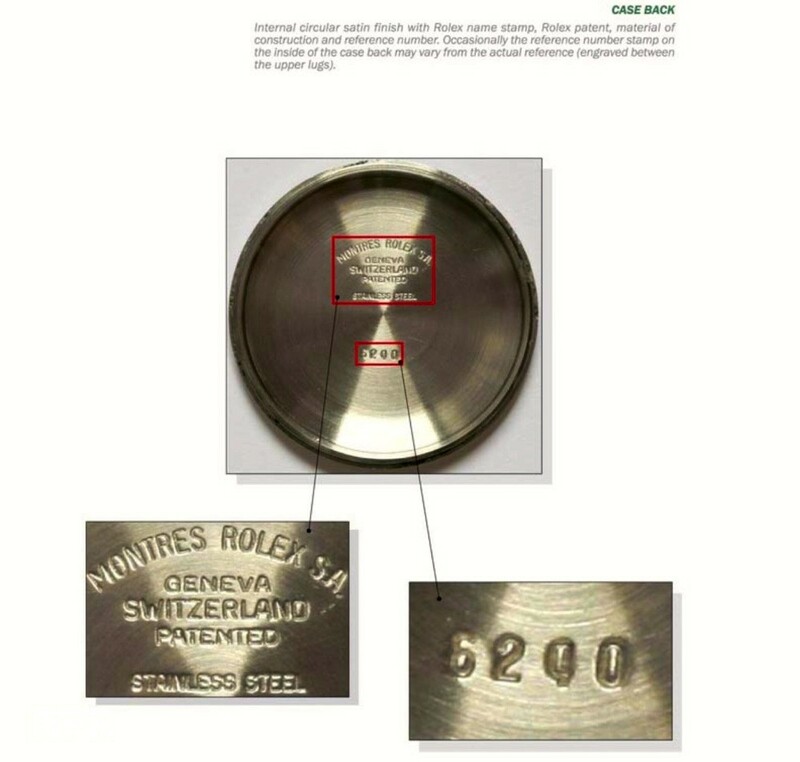 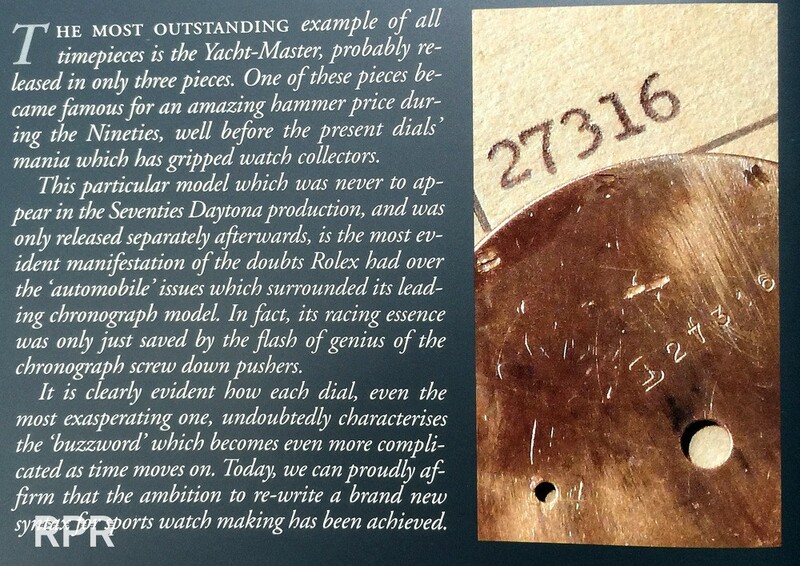 Another noteworthy feature is the different font used for the Rolex designation on this dial. 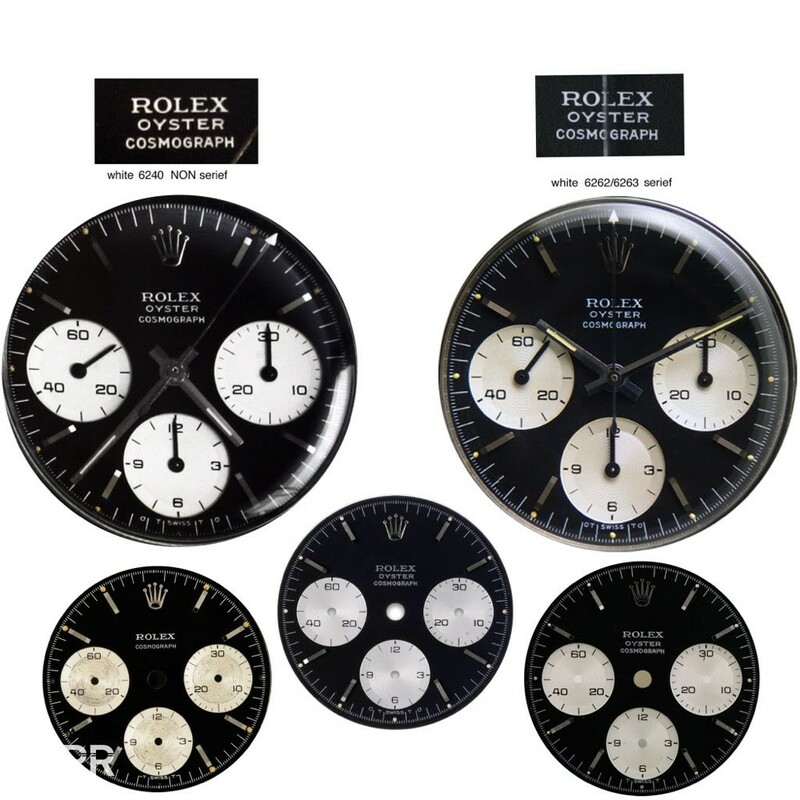 Compared to all other Paul Newman dials, except for a few rare dials made for ref. 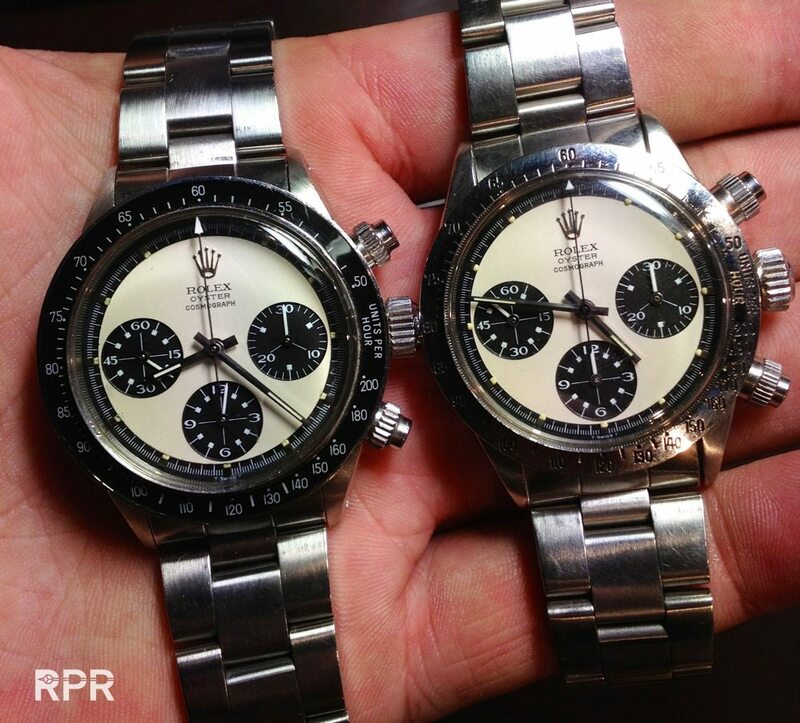 6262 and 6264, the R is bigger and the serifs more accentuated. 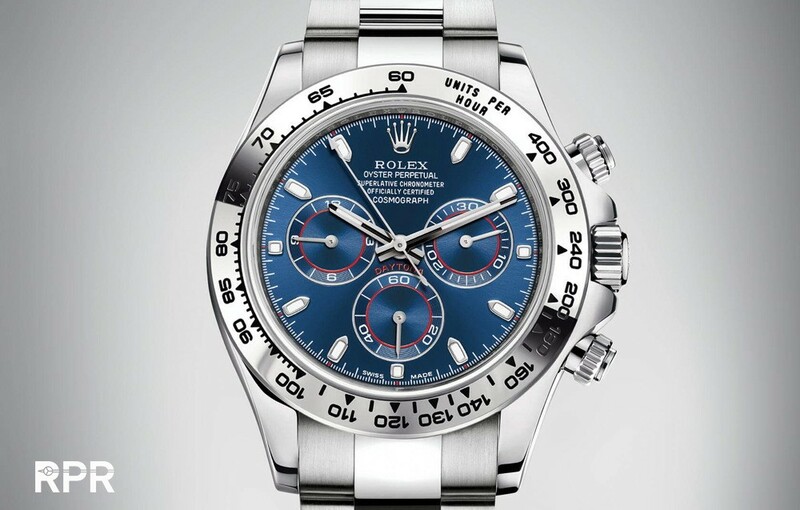 Beyond its graphical appeal, this feature enhances the value and desirability of the present timepiece. 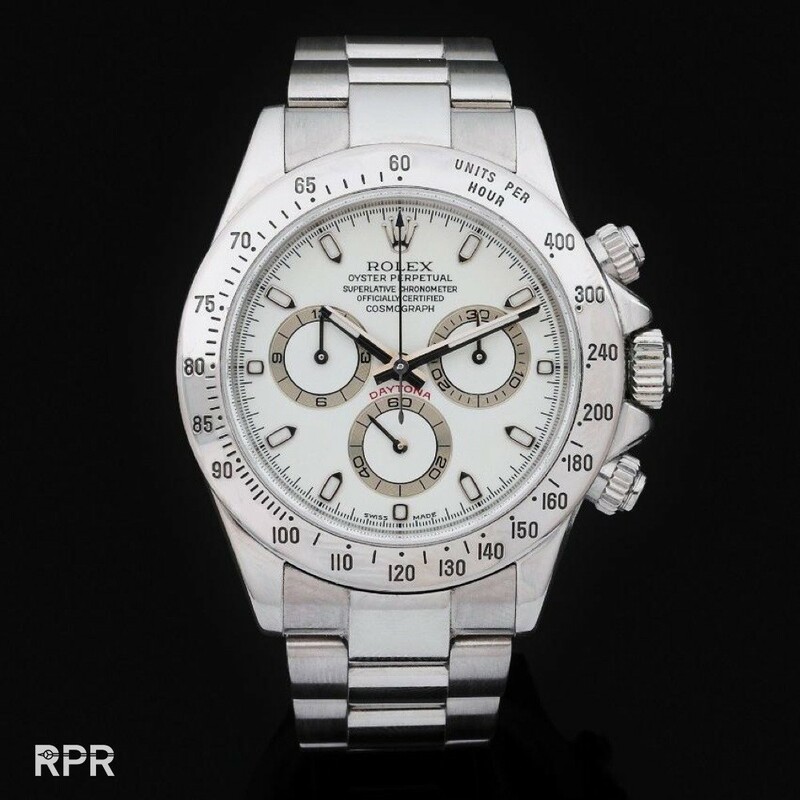 Consequently, this watch reflect characteristics typical of the first series production. 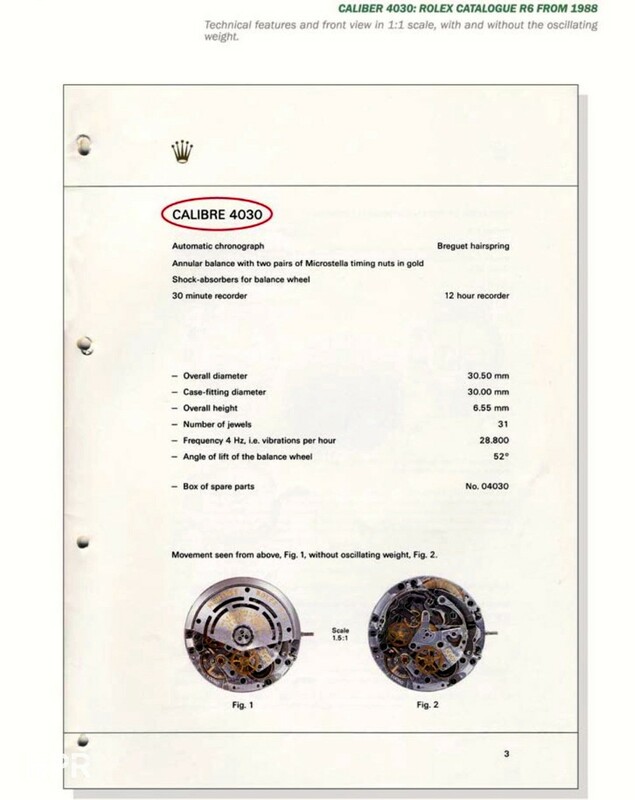 For example, the main case body and bezel are derived from previous models, the case back is internally stamped 6239, the caliber is 727, and the screw-down pushers are millerighe. 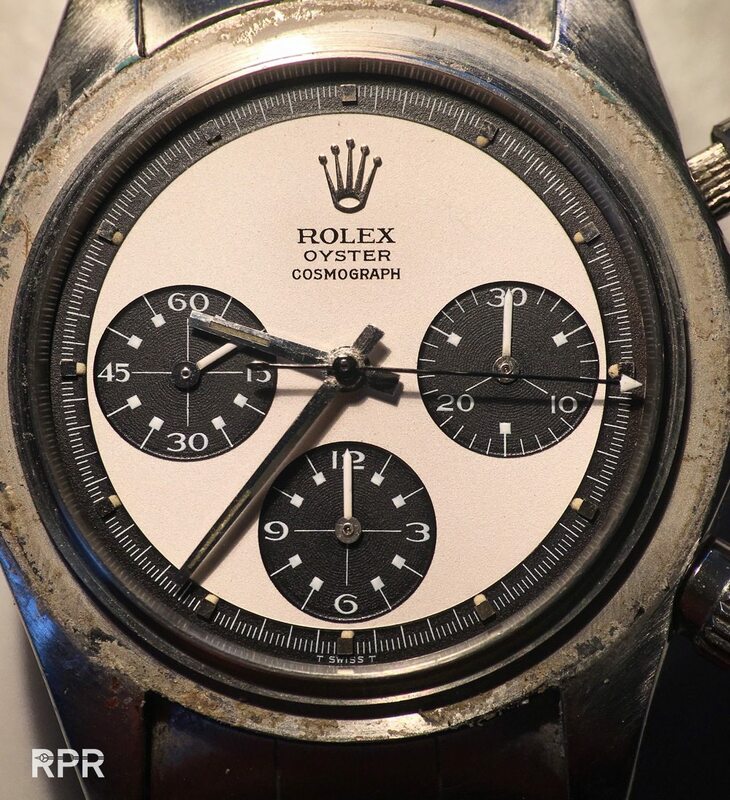 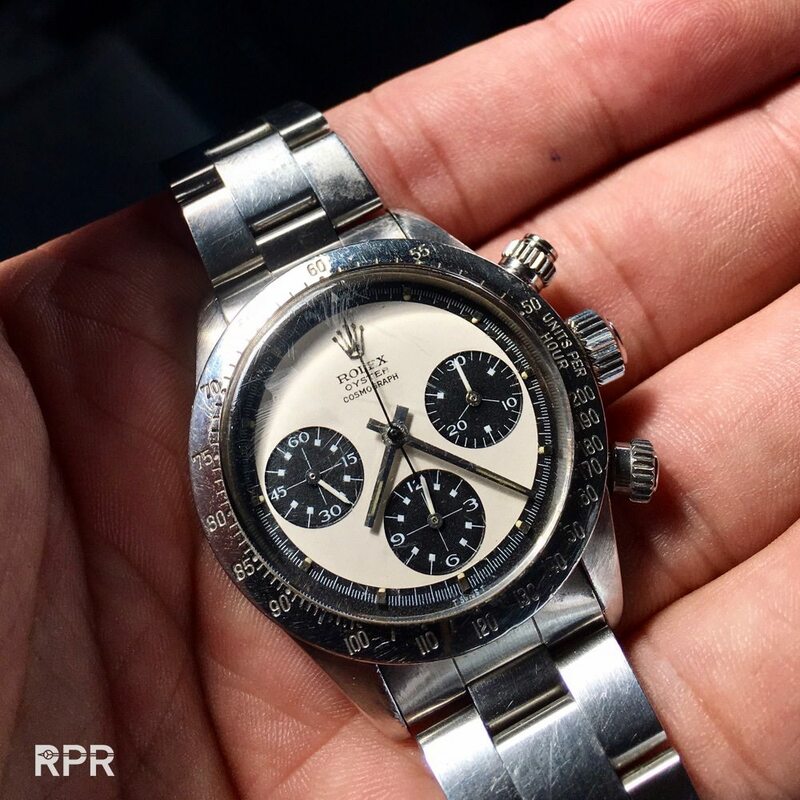 A rare white RCO is for sale on RPM, follow the link to our trusted RPM market place..
Only a handful of examples are know of the gold Ref 6263 Oyster Paul Newman.. 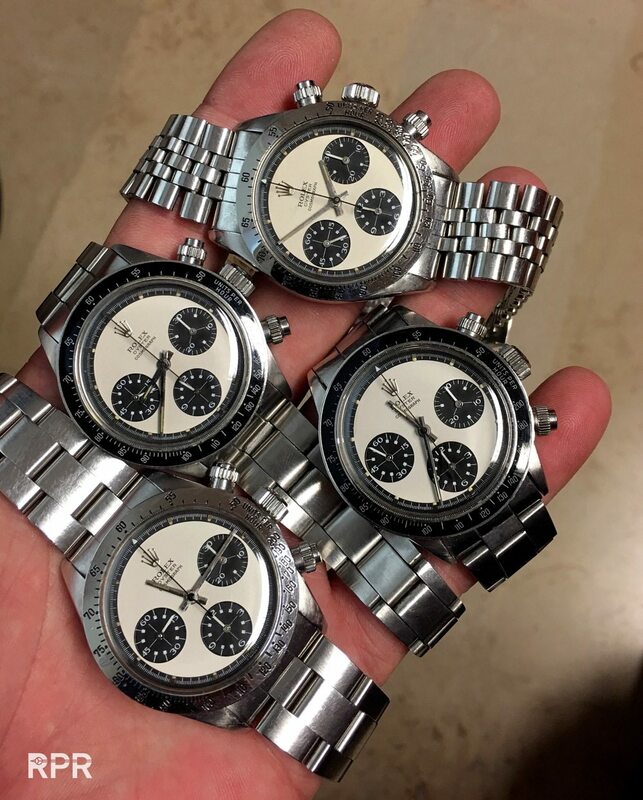 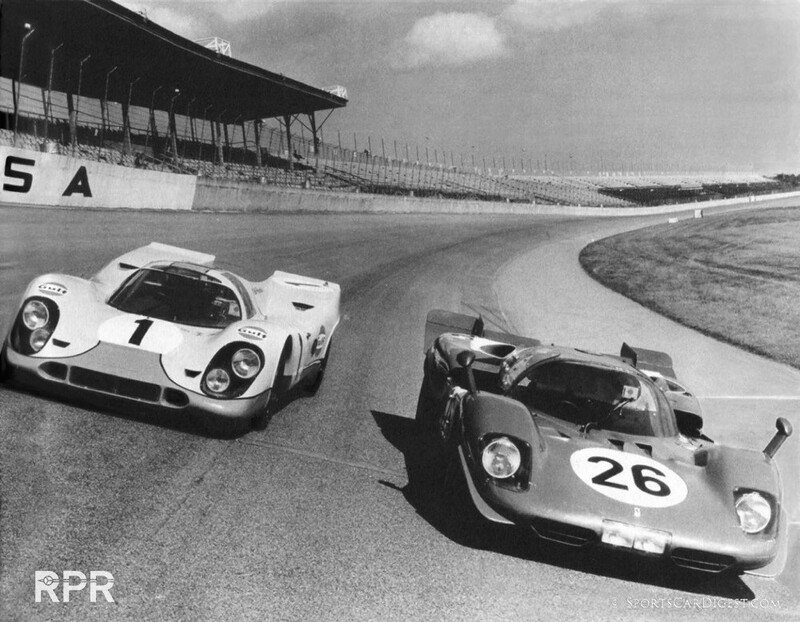 Some special deliveries of the Oyster Daytona made by Rolex, here the so far unique Pan Am. 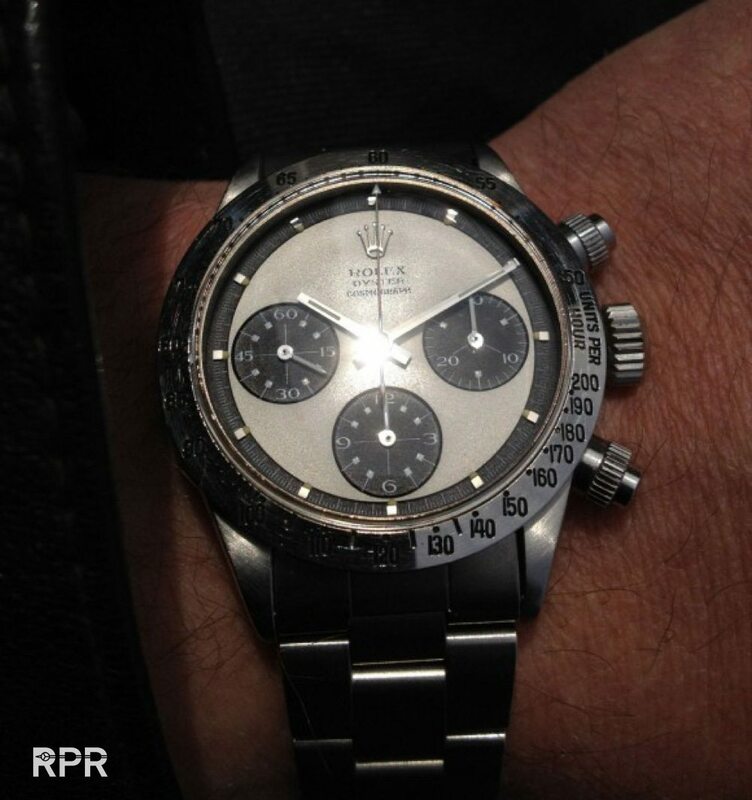 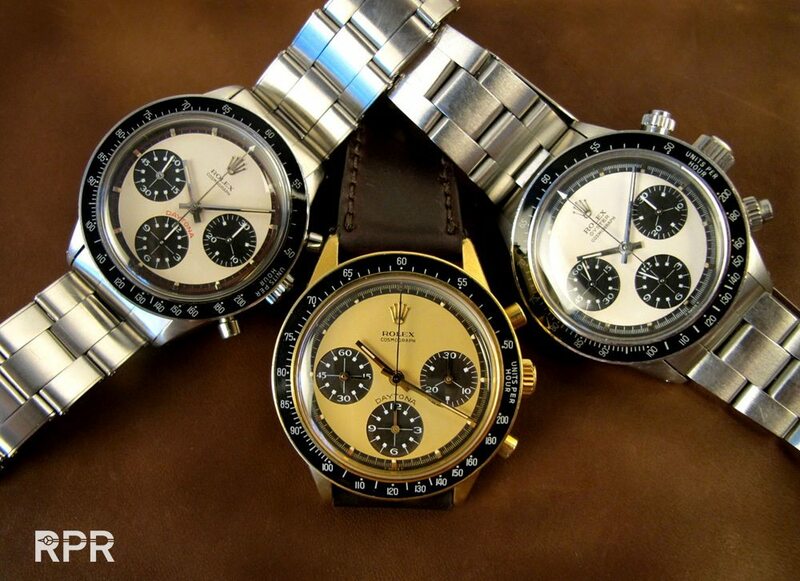 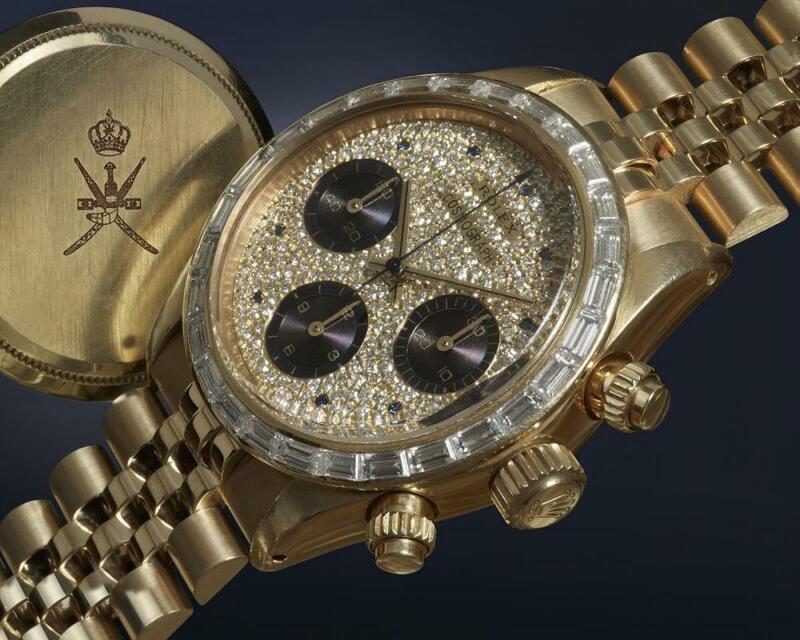 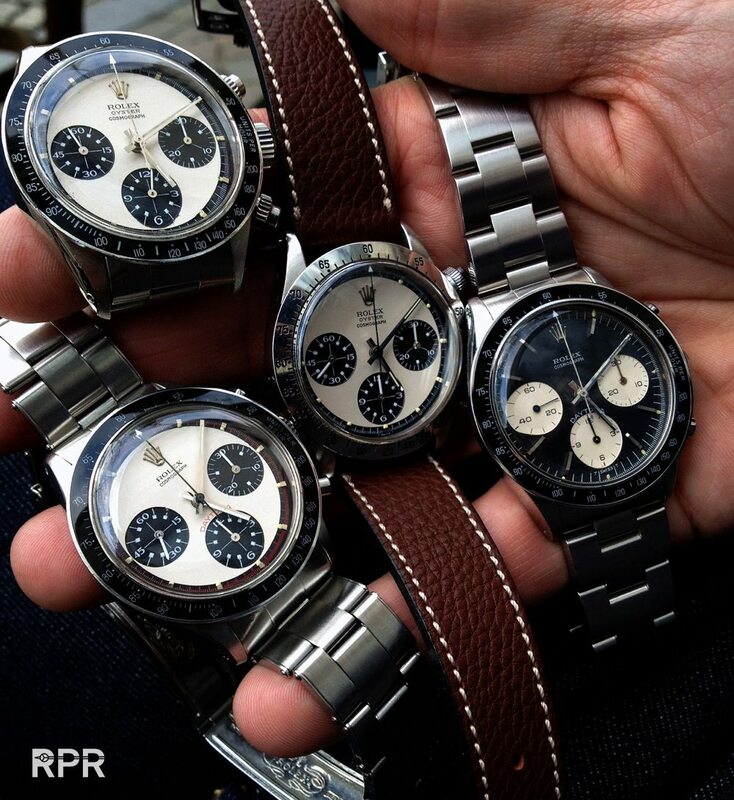 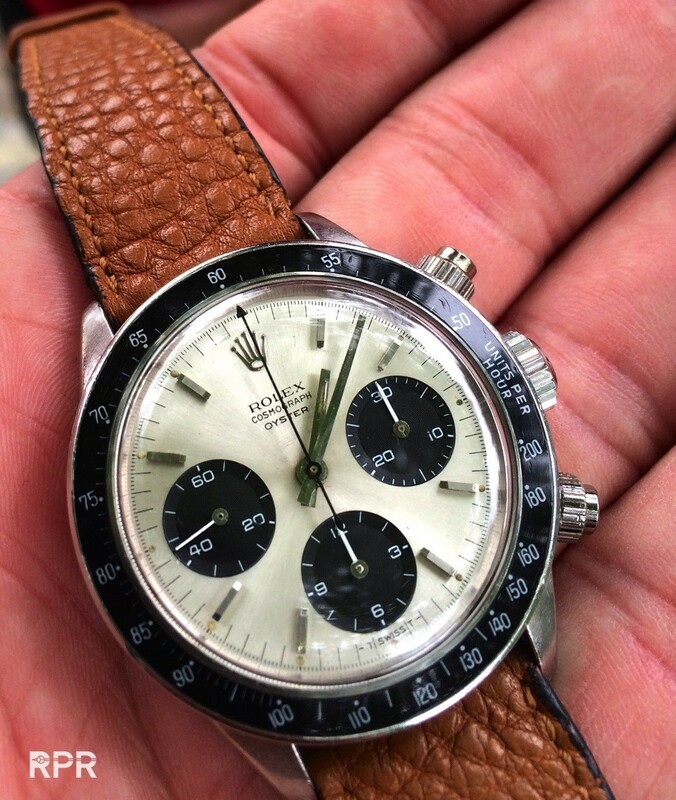 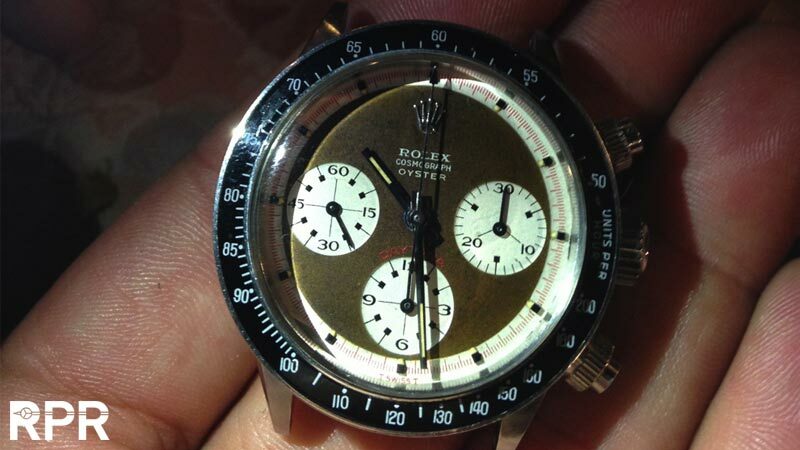 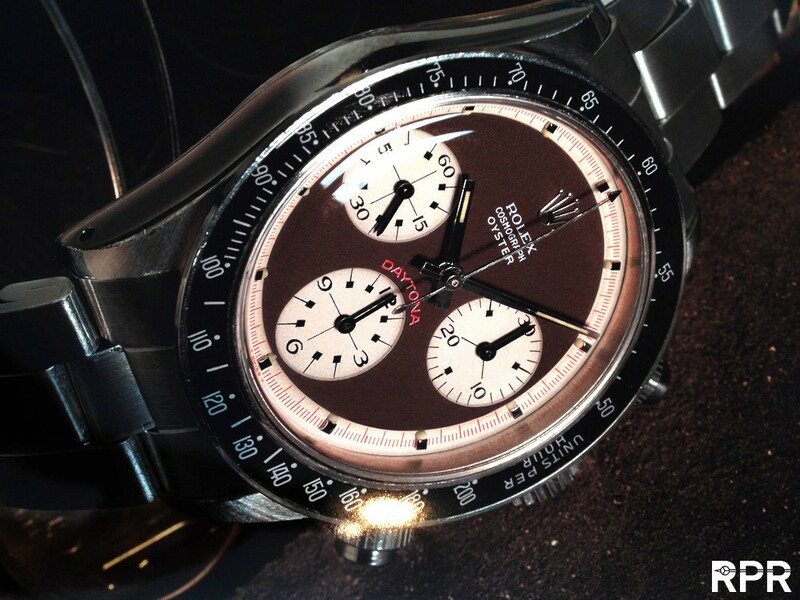 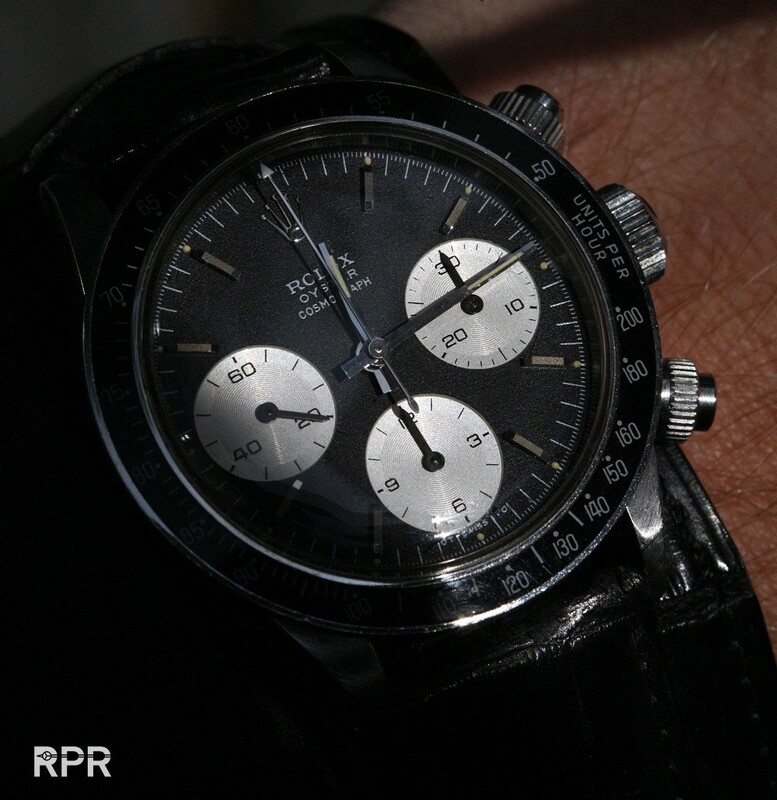 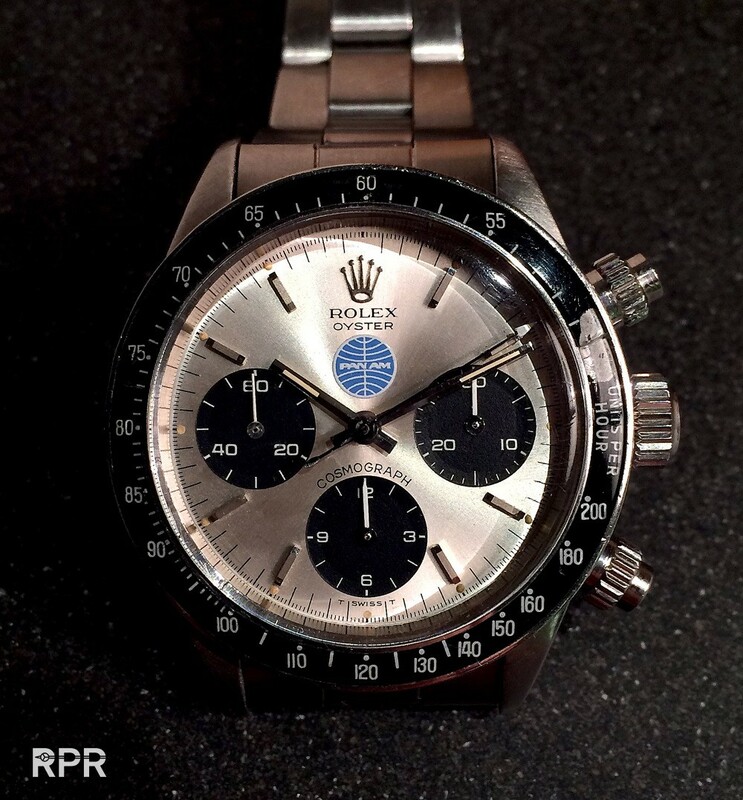 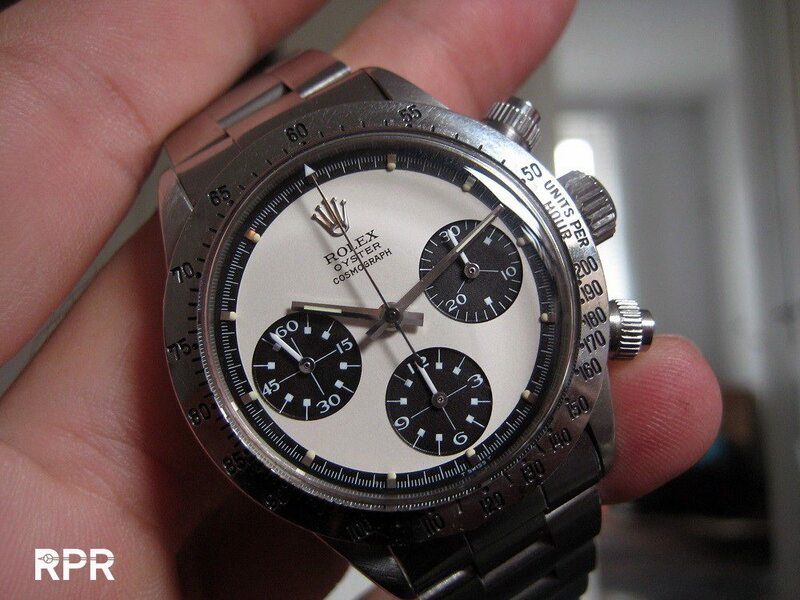 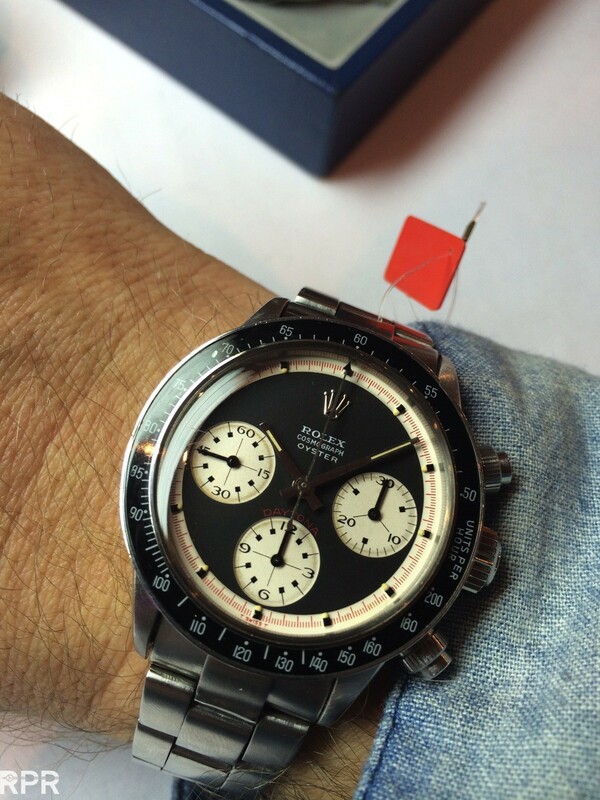 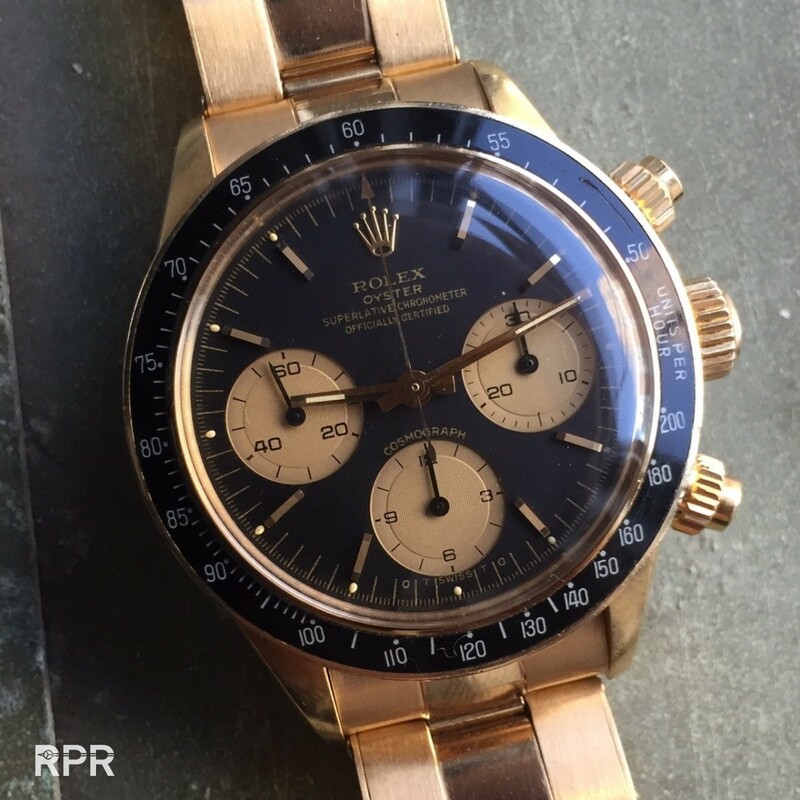 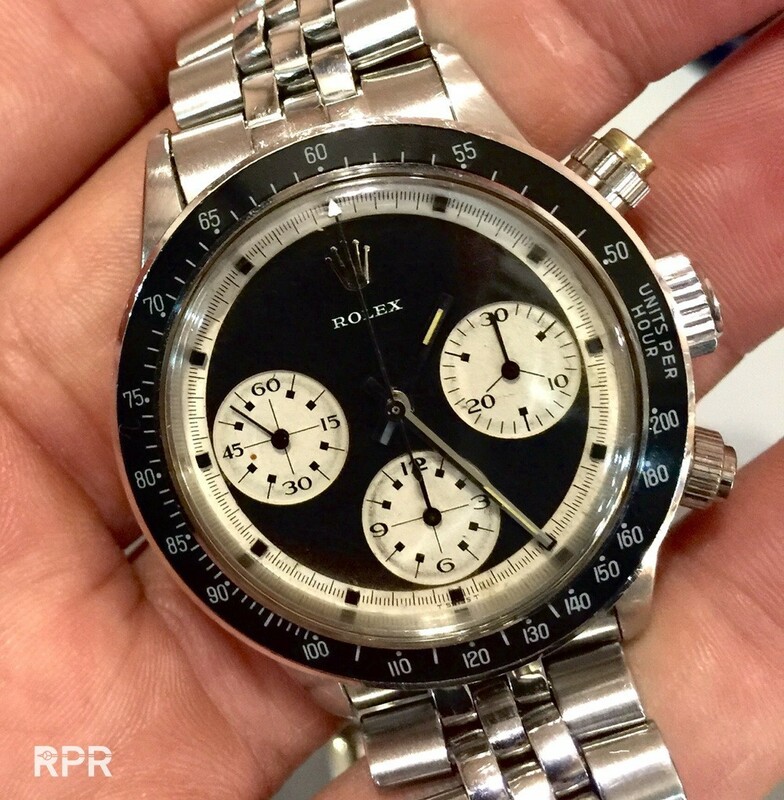 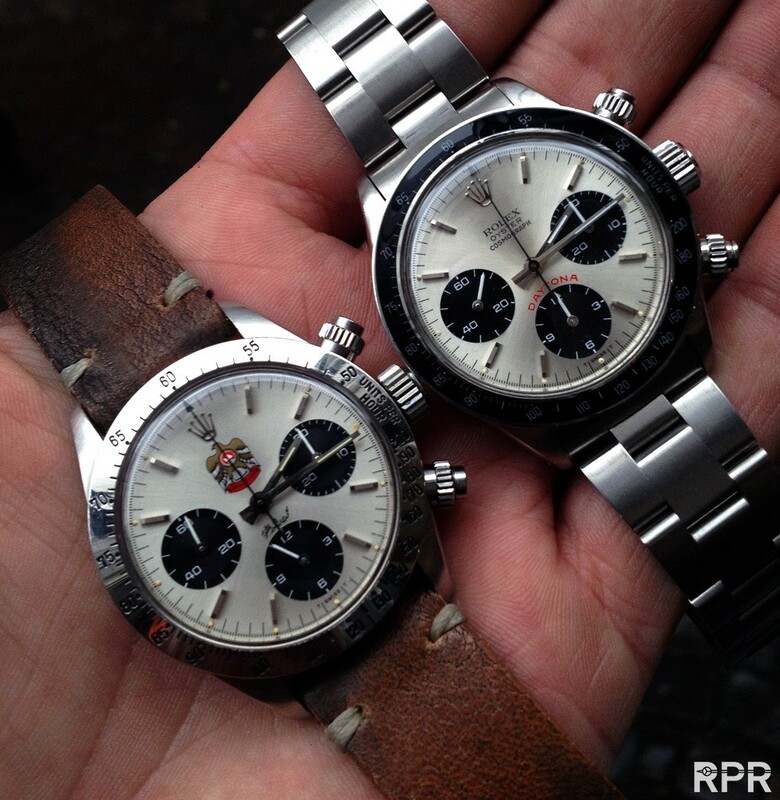 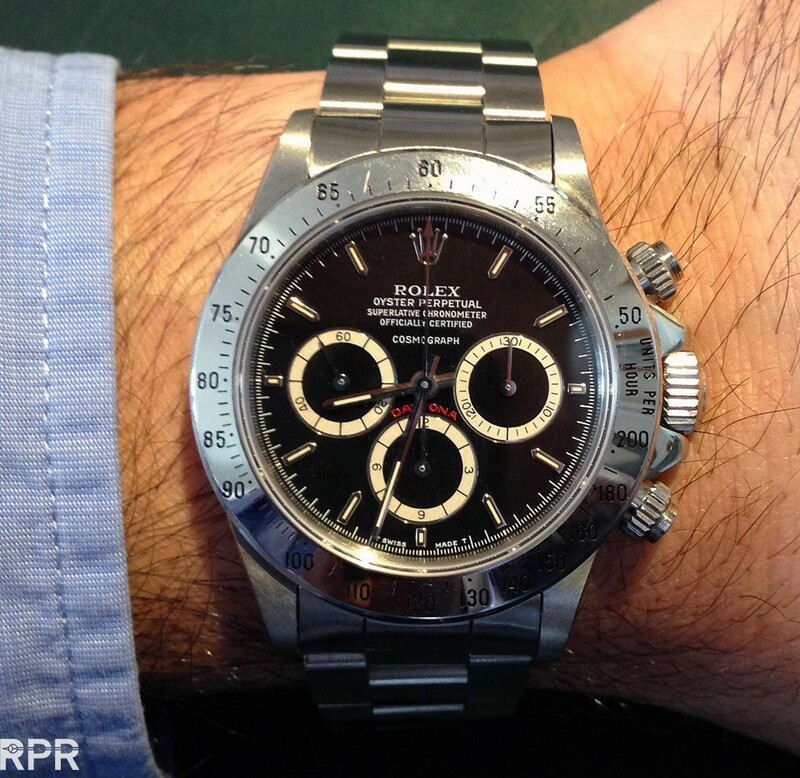 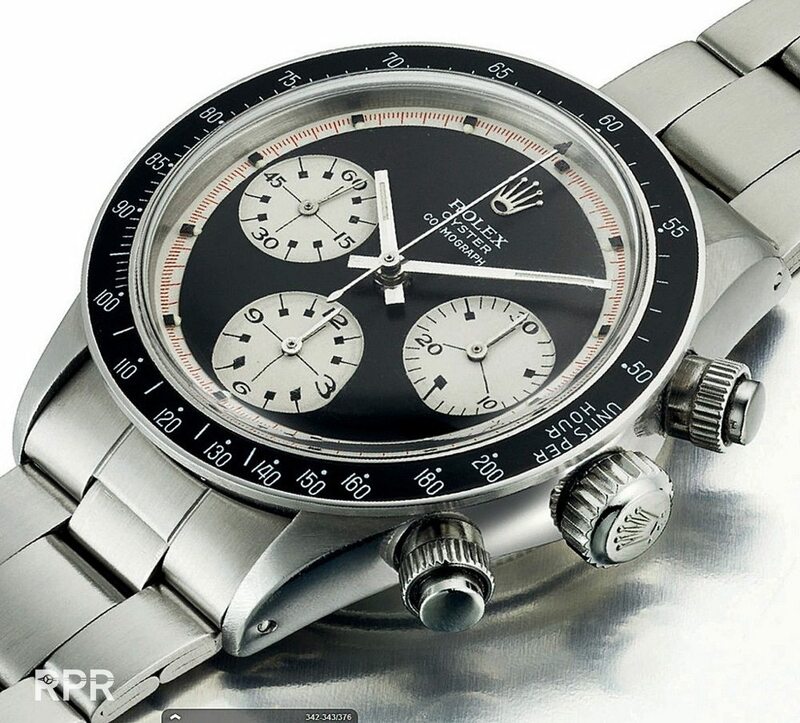 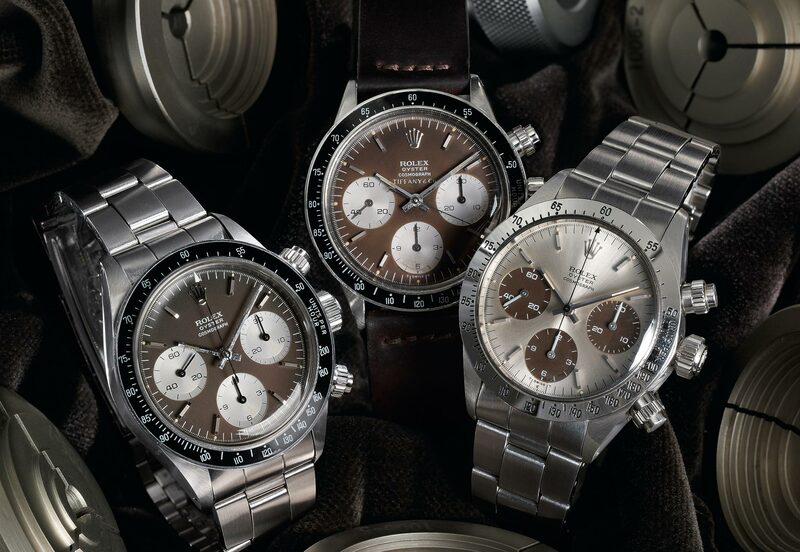 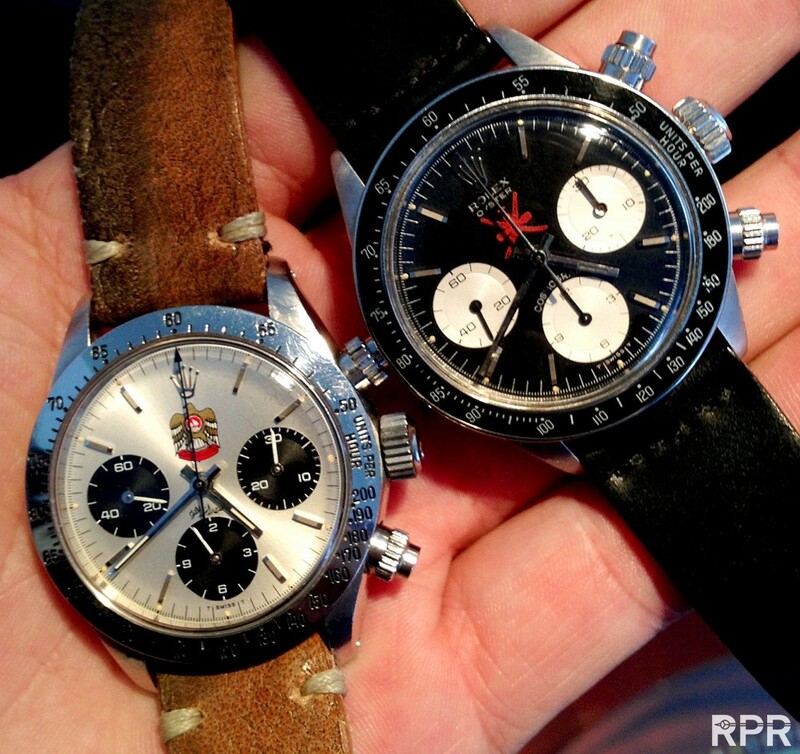 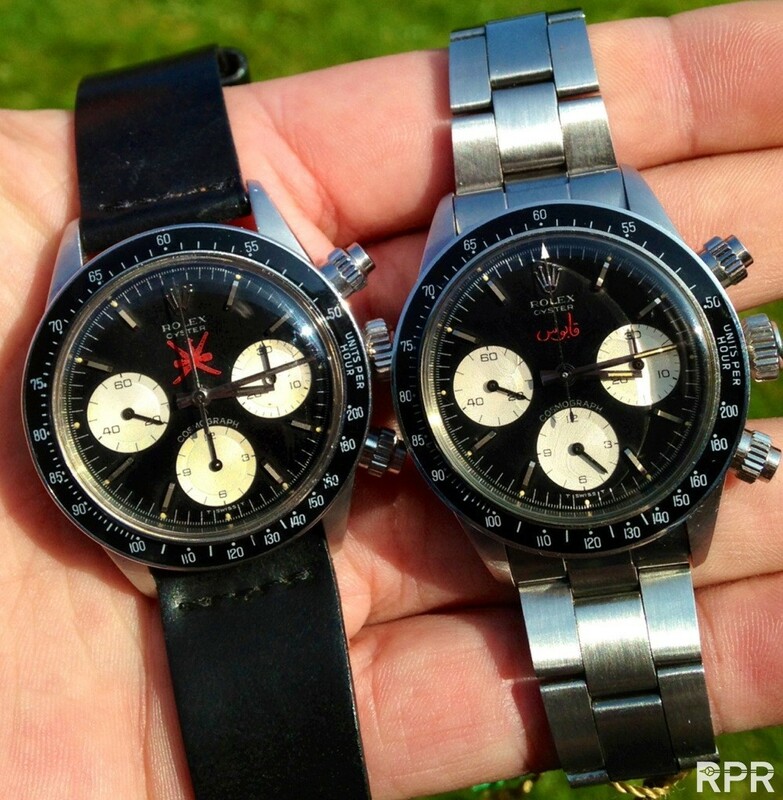 Read all about it at my RPReport..
Bling Daytona’s, the rare ref 6270.. 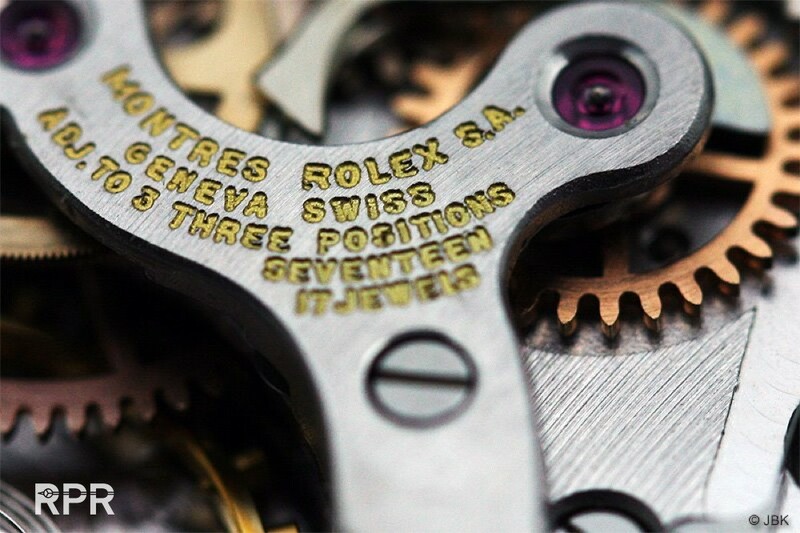 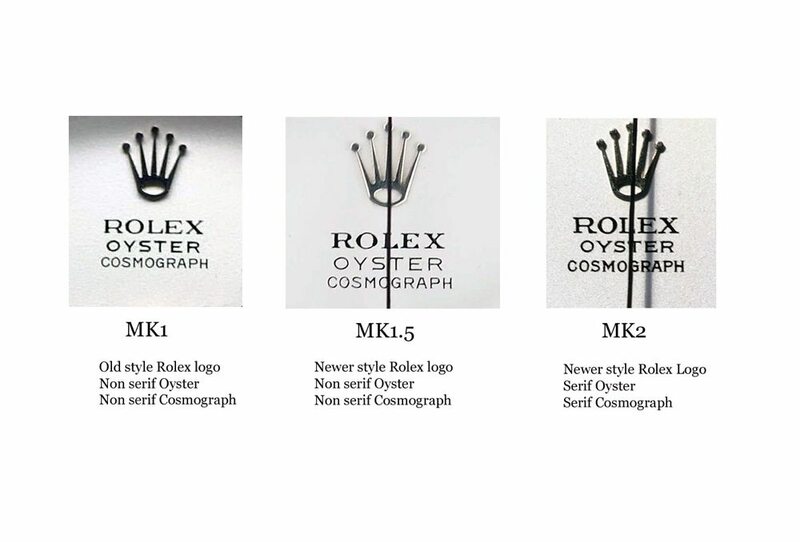 The specific Rolex typography thats been used in the Oyster Daytona..
Something I get asked a lot, what is the difference in screw down pushers. 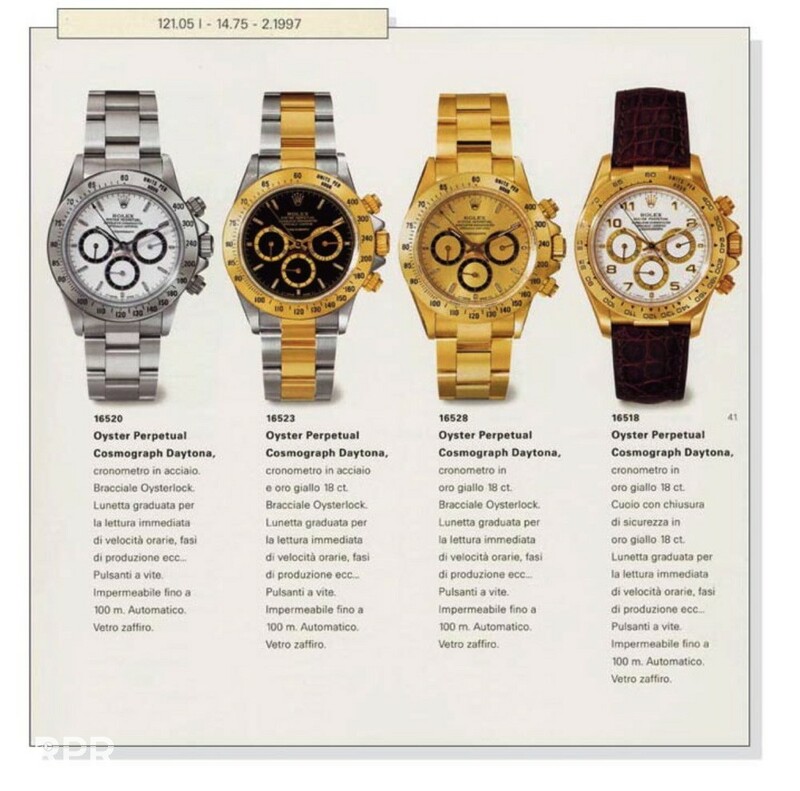 Below Stefano shows you the main differences. 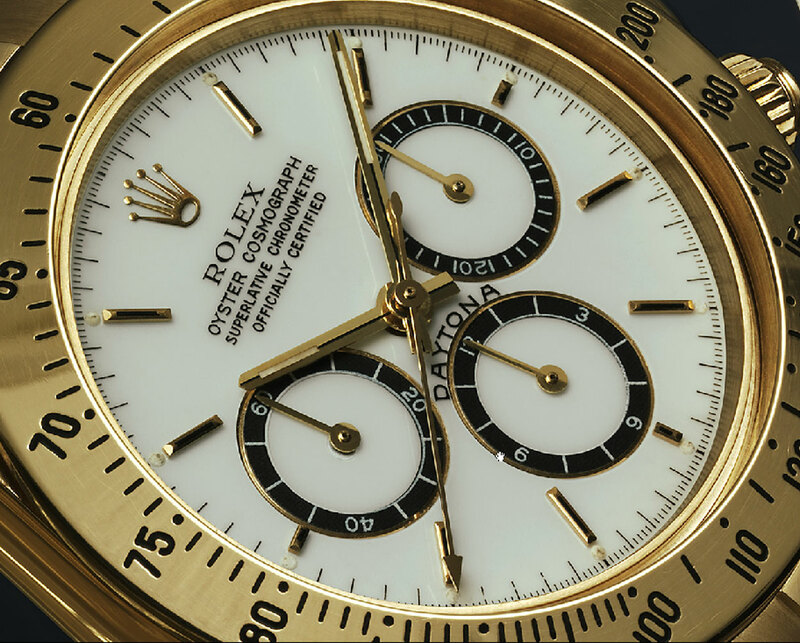 Many Daytona have lost their original screw down pushers during a later service as Rolex wanted to update their quality of waterproofness. 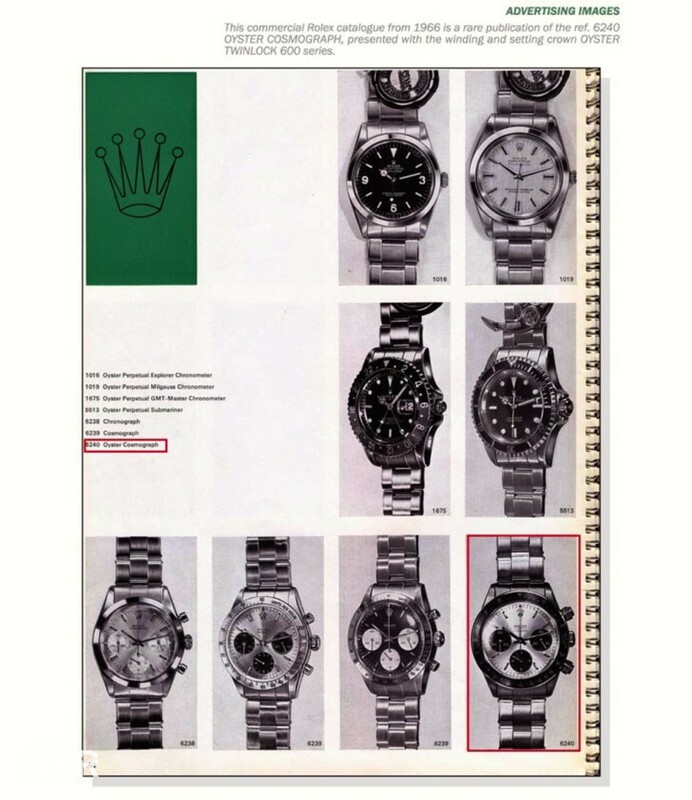 In the same time, for collectors, Rolex destroyed the originality, something back then nobody cared about but now is a big issue. 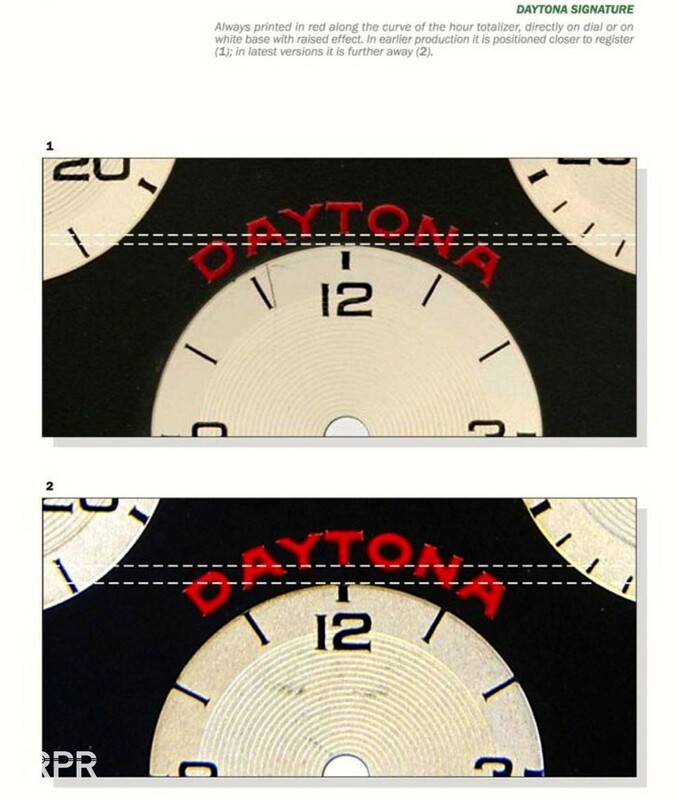 With spare part prices of early MK1 going to 5K it matters enormously if your Daytona is having the correct pushers or not. 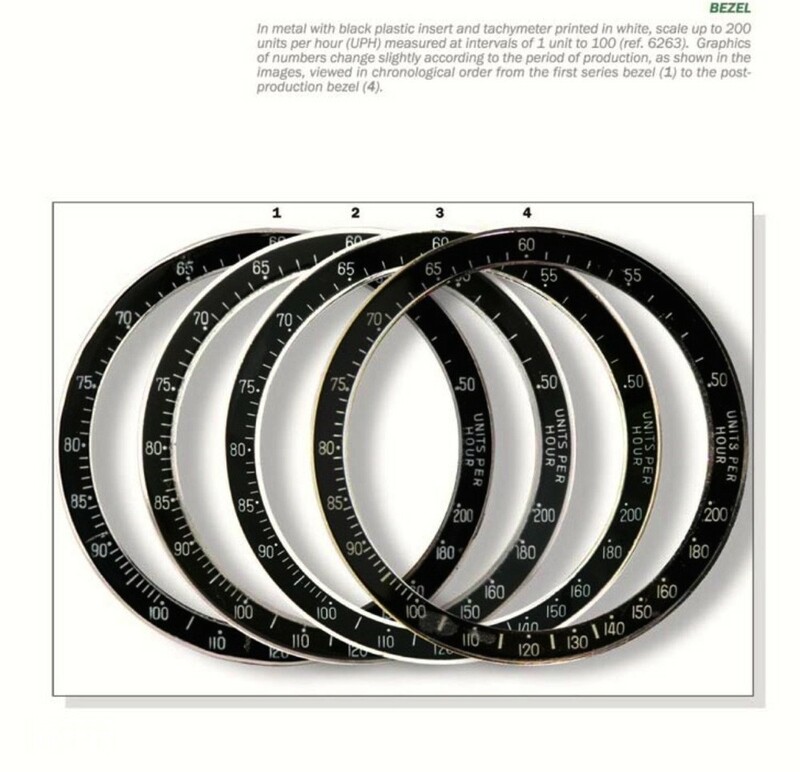 Yet another hot topic, the correct bakelite bezels. 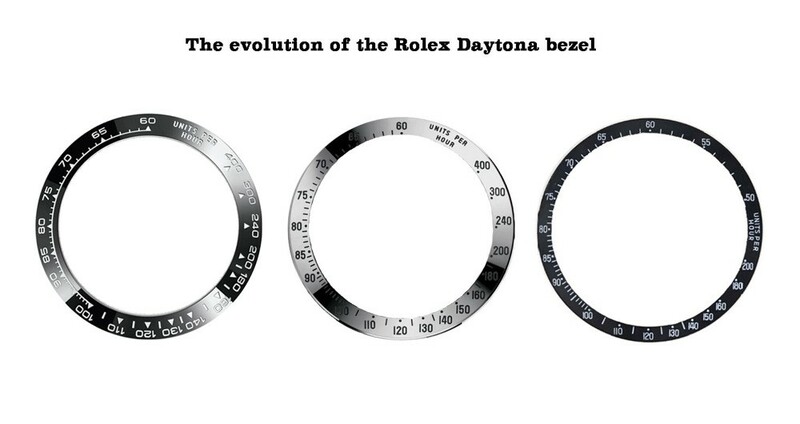 If you focus on the 2 of 200 then you notice immediately the different typography that has been used. 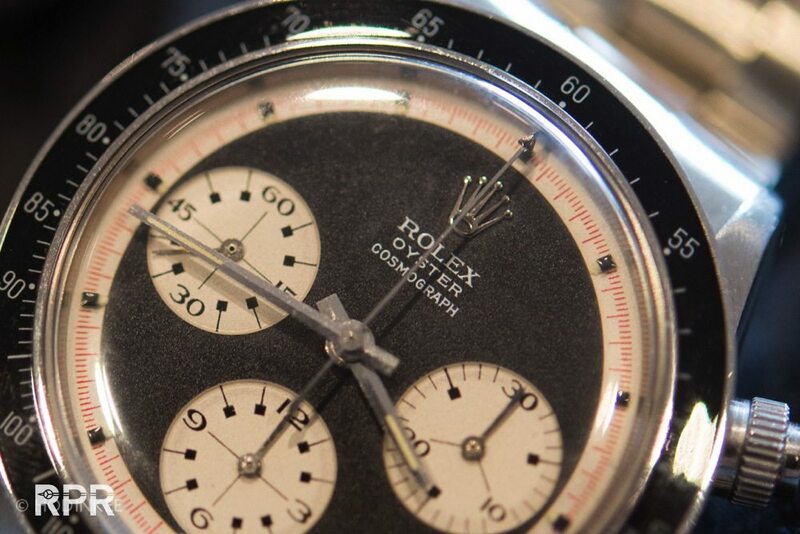 Same as with the correct screw down pushers, having an MK1 bakelite bezel on your Ref 6240 is adding substantial value. 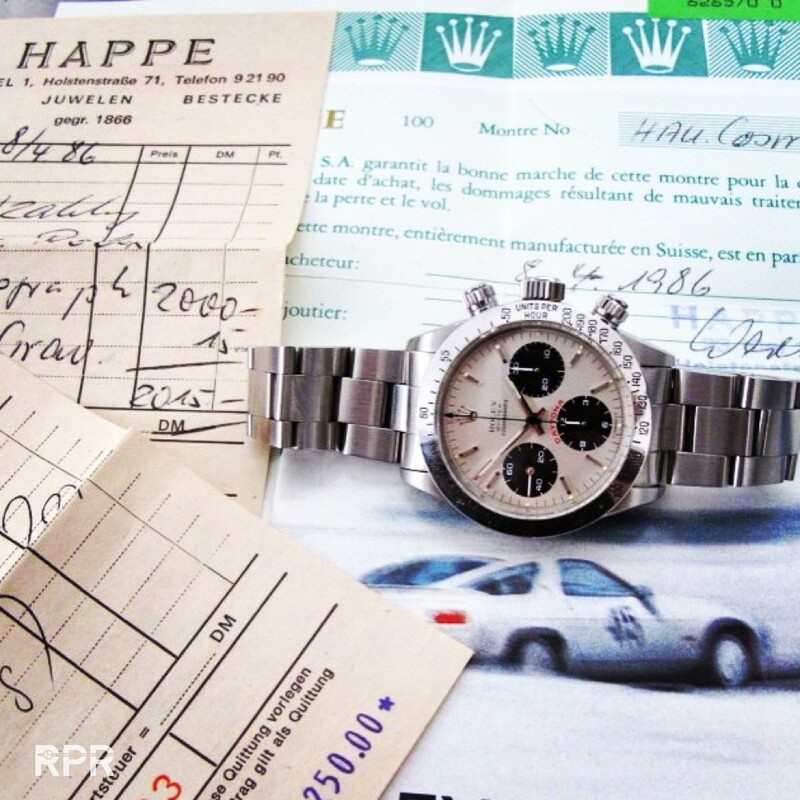 The spare part prices for an MK1 are reaching 5K and more already!.. 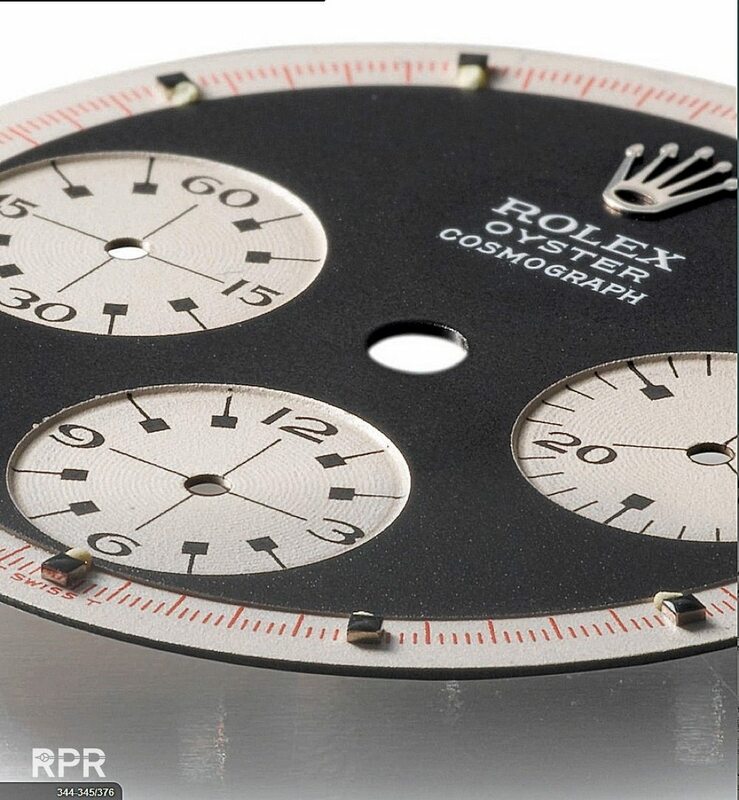 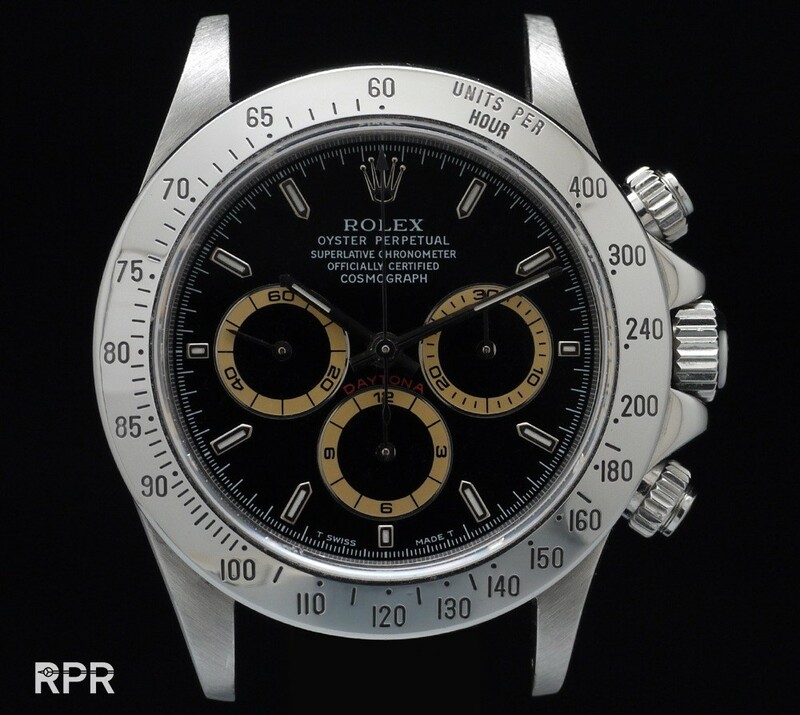 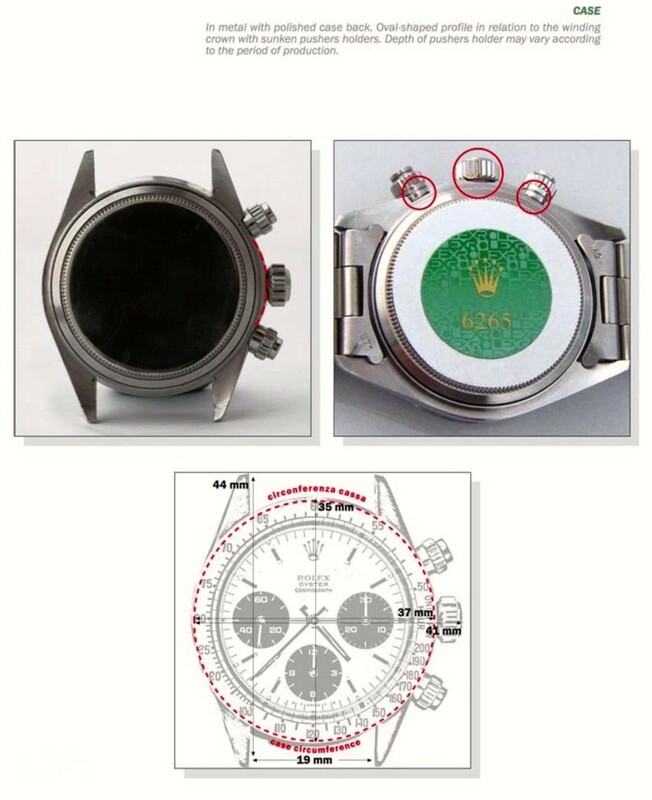 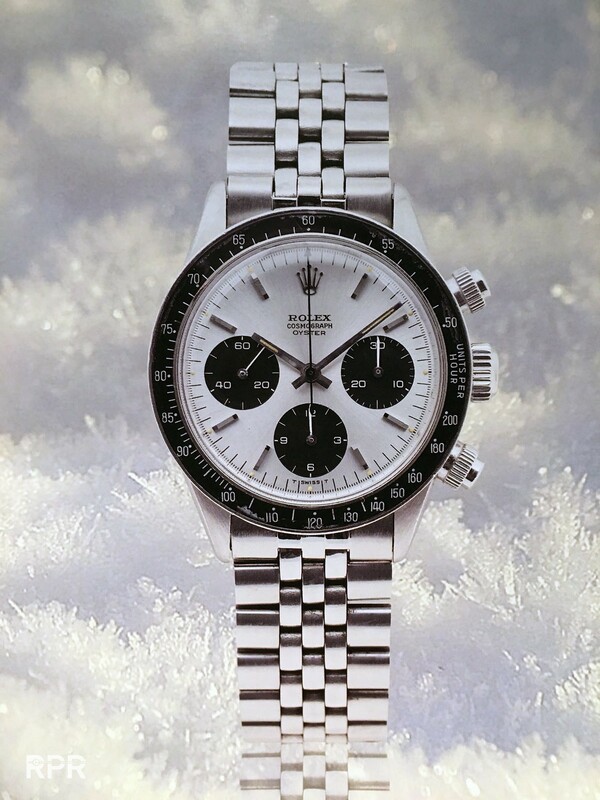 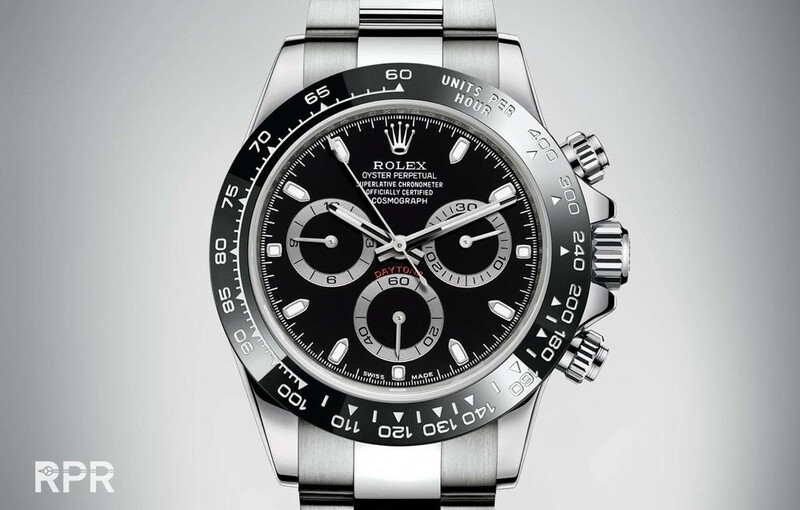 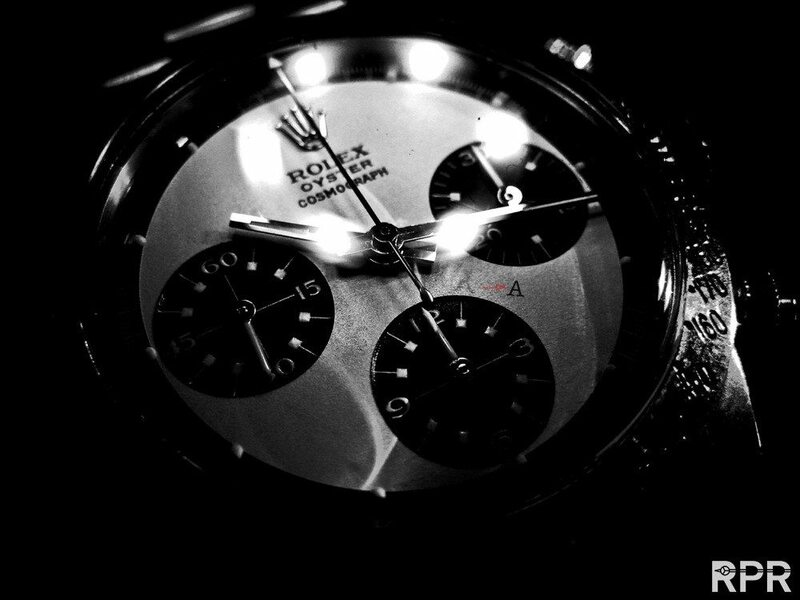 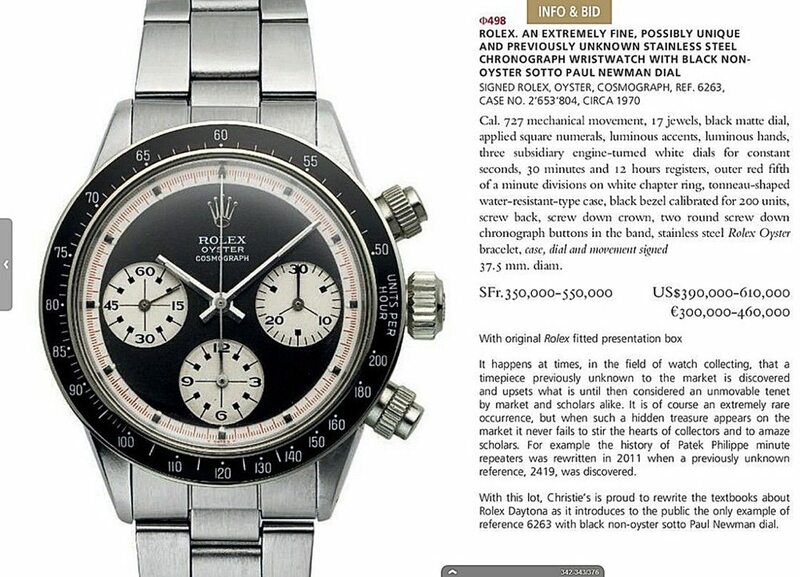 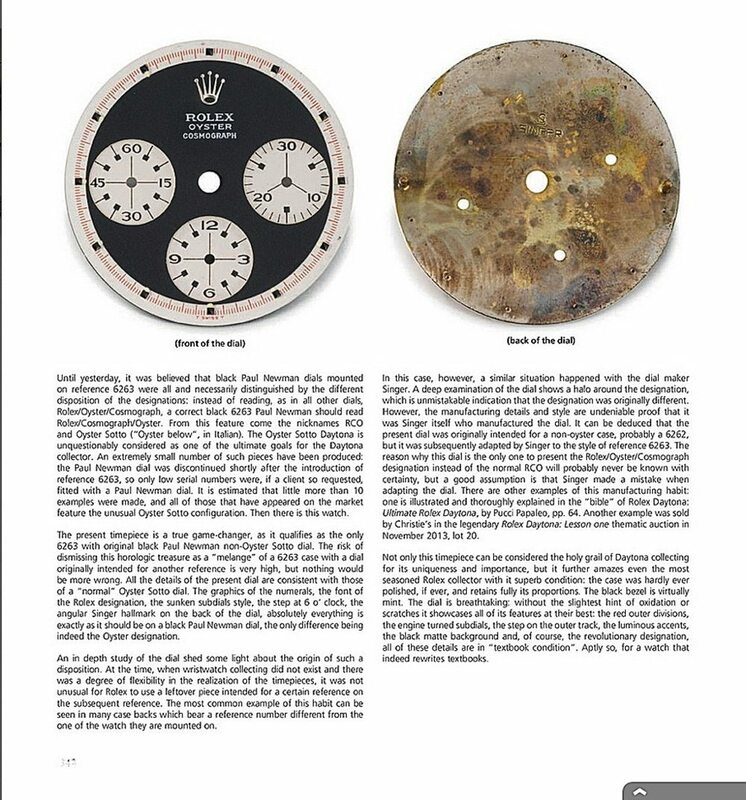 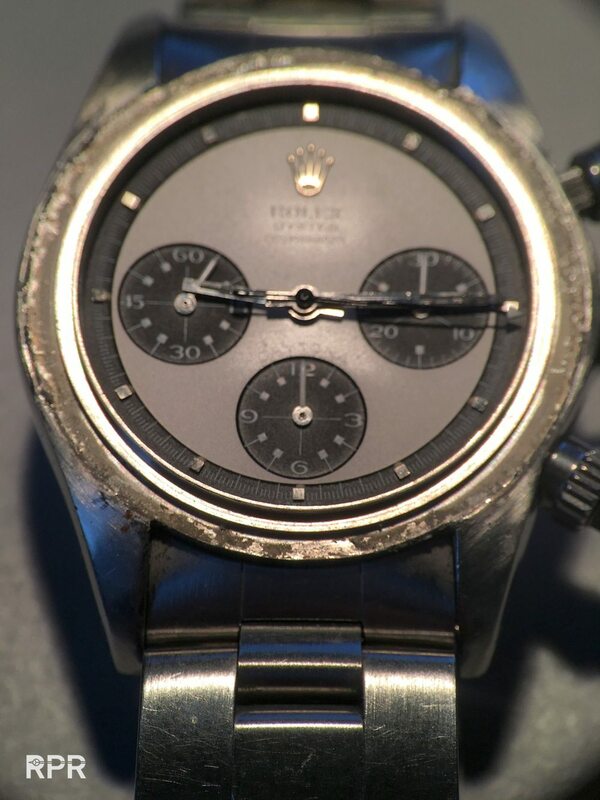 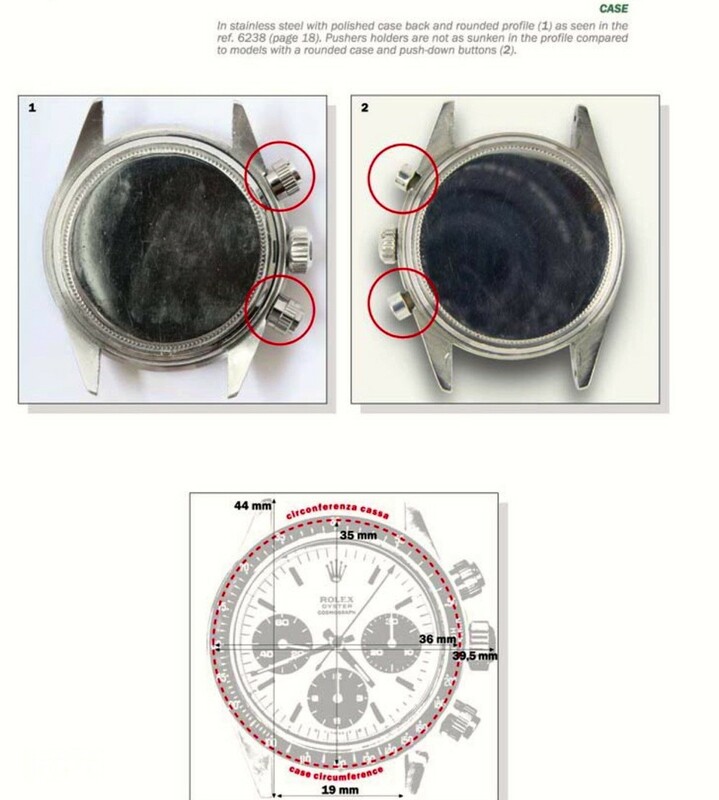 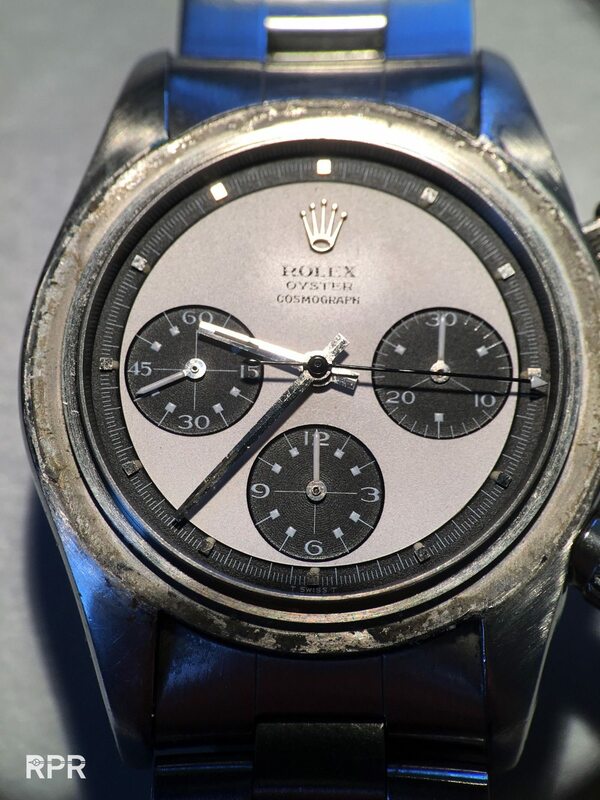 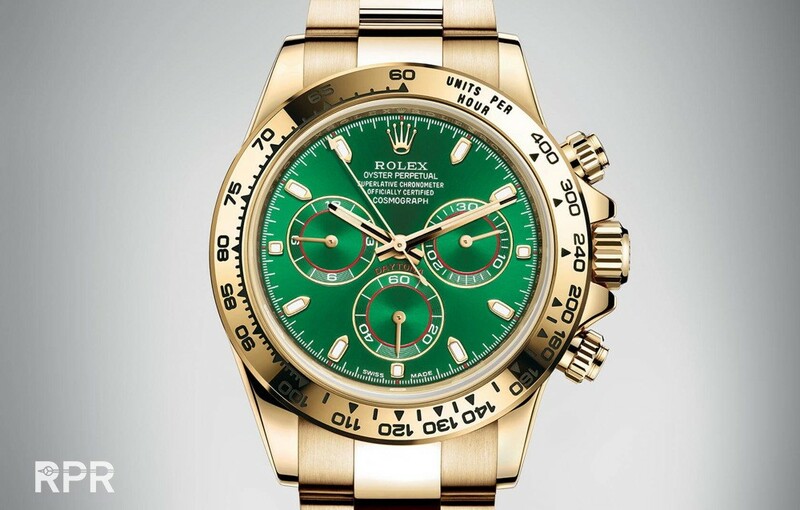 Official Rolex documentation teach us: “A stop watch, guaranteed waterproof to a depth of 165ft in it’s oyster case, when push button and winding crown are screwed down”..
Then another question I get a lot of times, the difference between old and service Daytona dial. 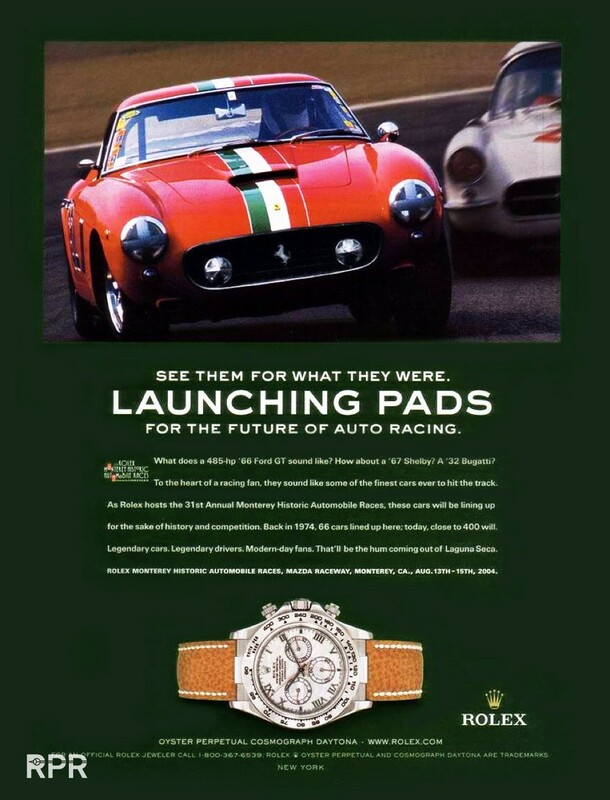 Or the so called “Big Red ” signing. 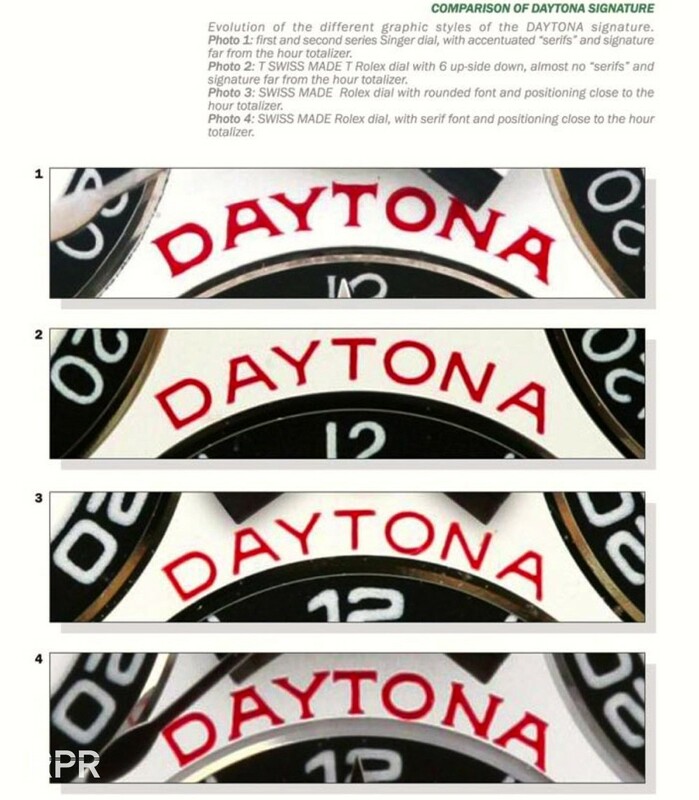 How do you see the difference? 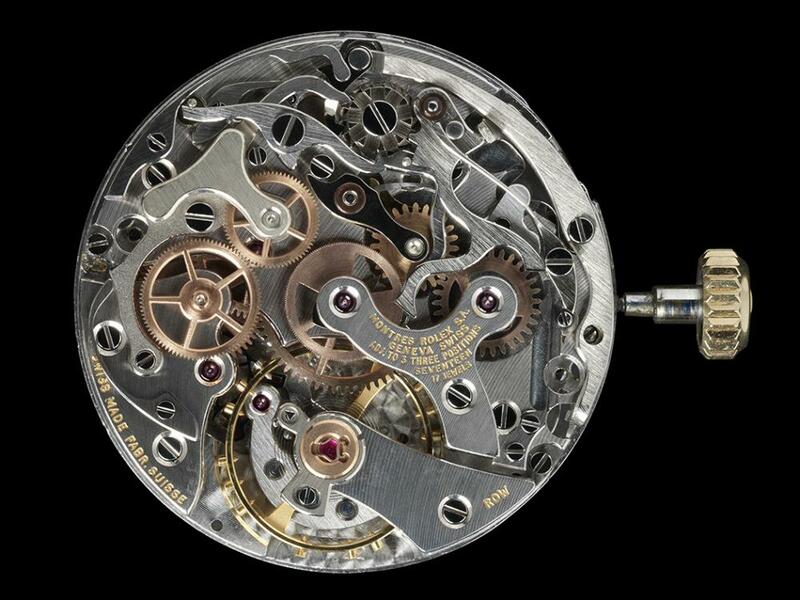 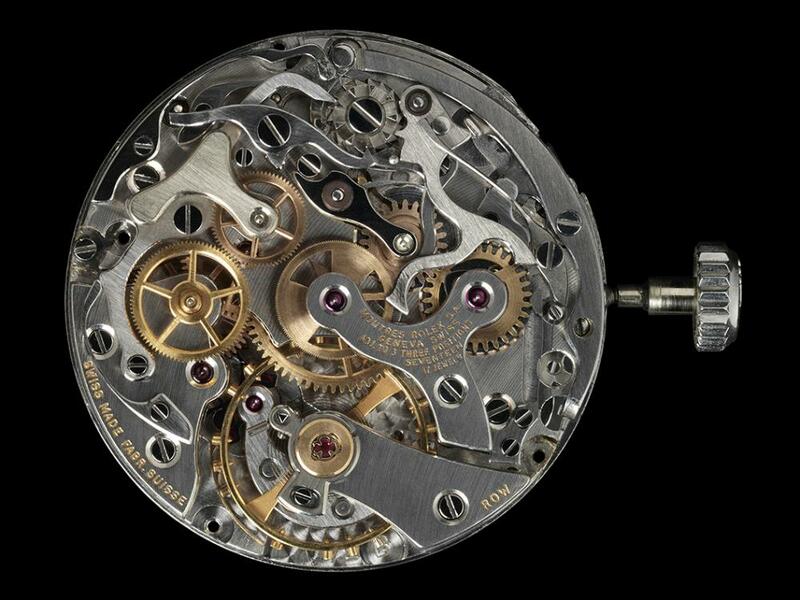 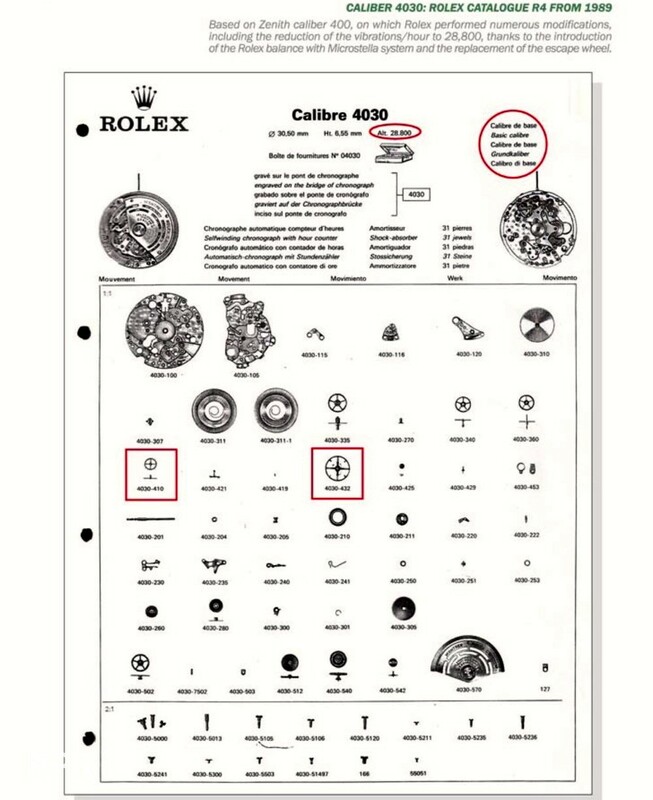 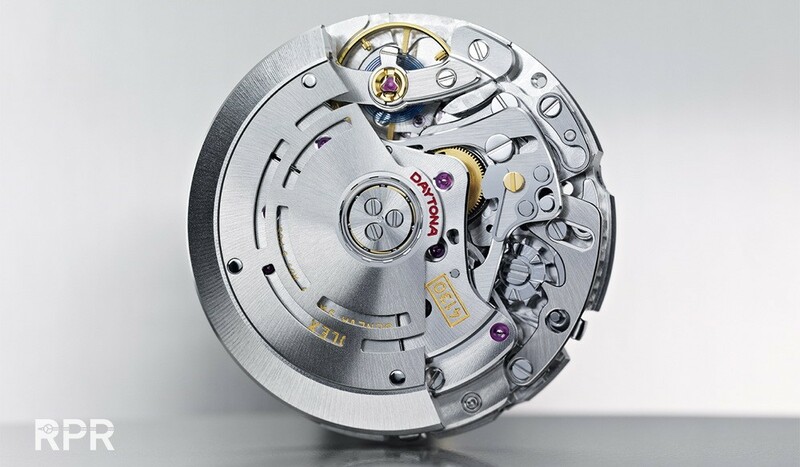 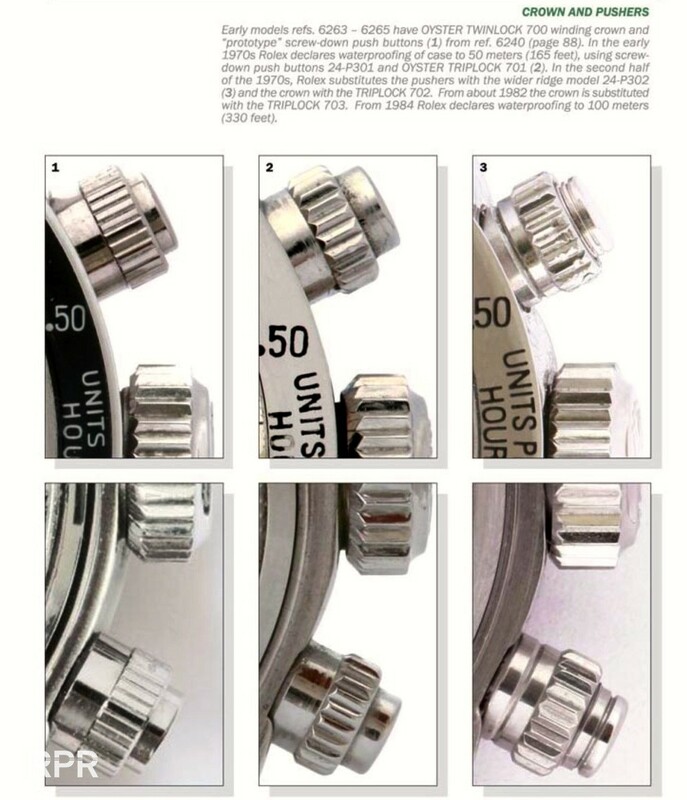 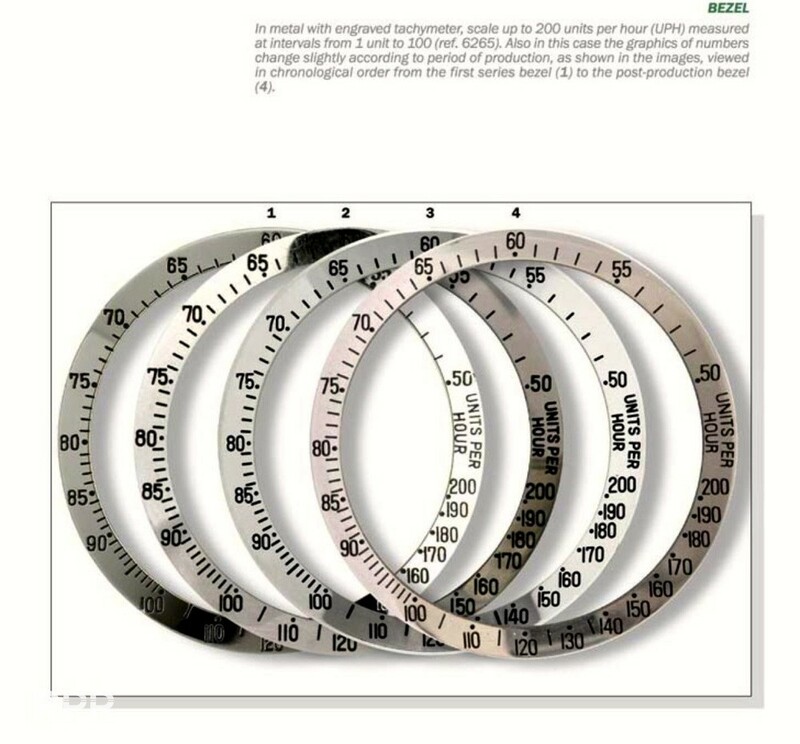 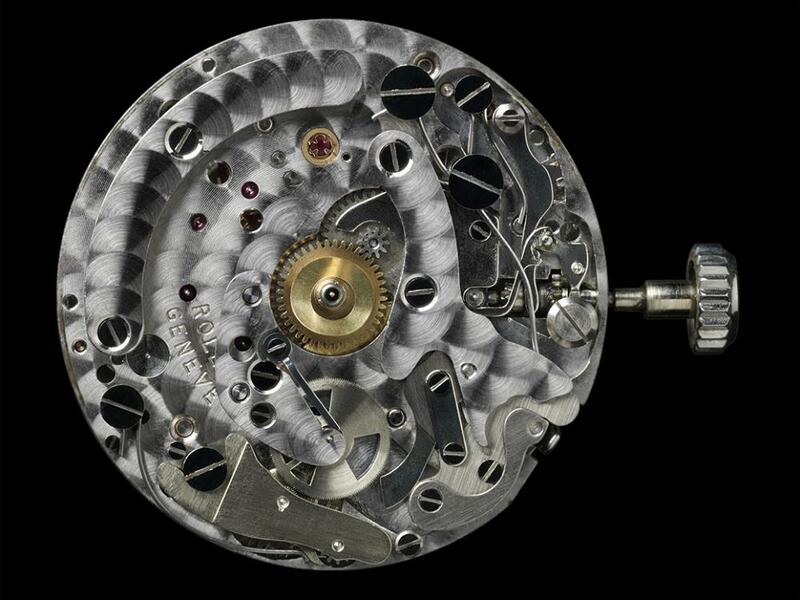 In below picture from Stefano all is explained..
Data sheet of the new automatic Rolex movement, the caliber 4030. 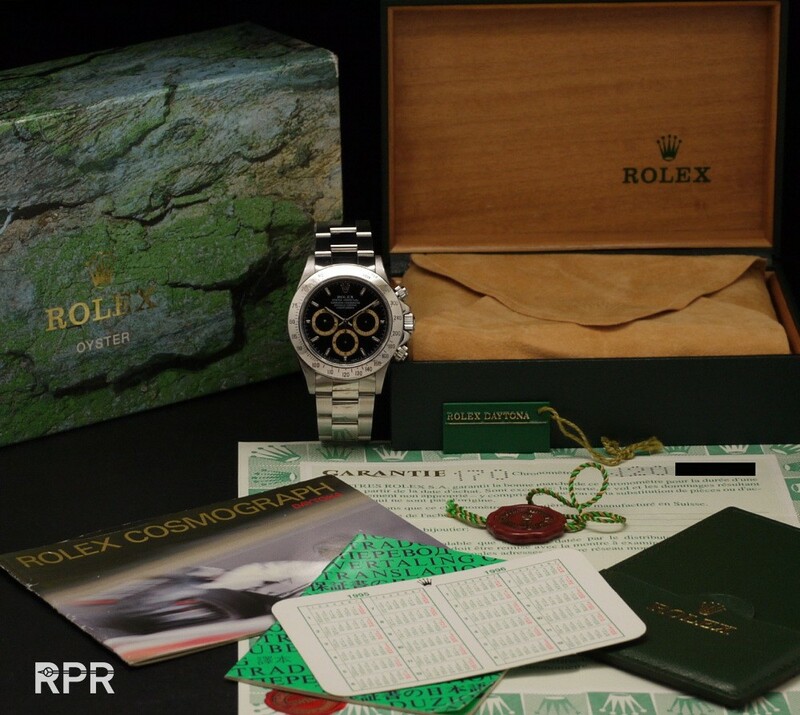 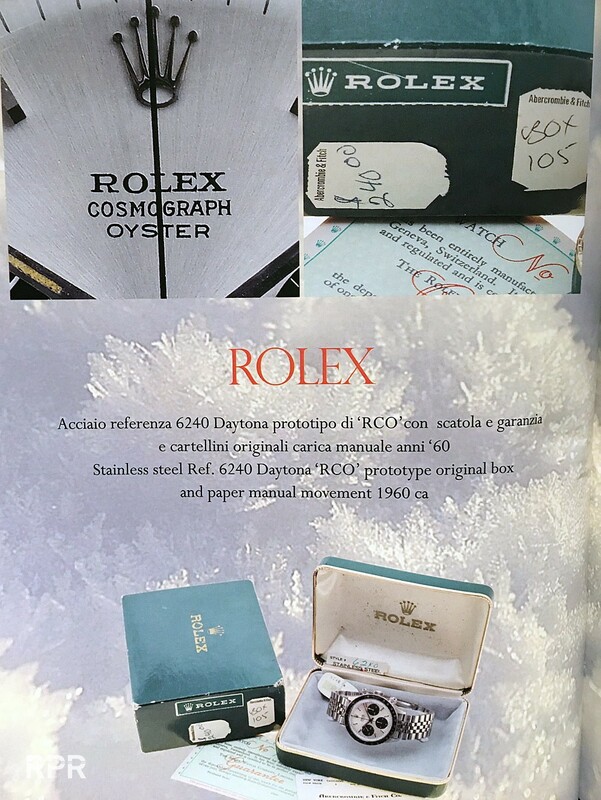 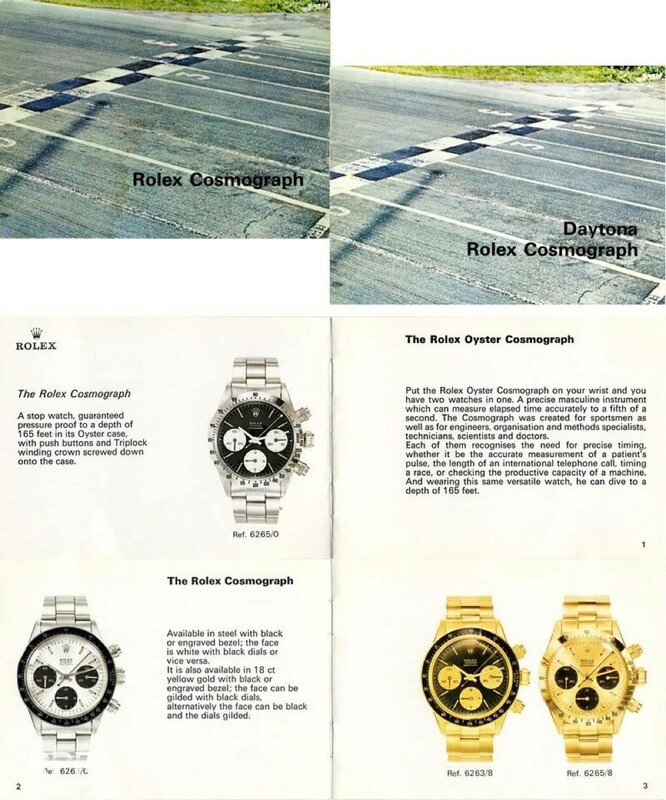 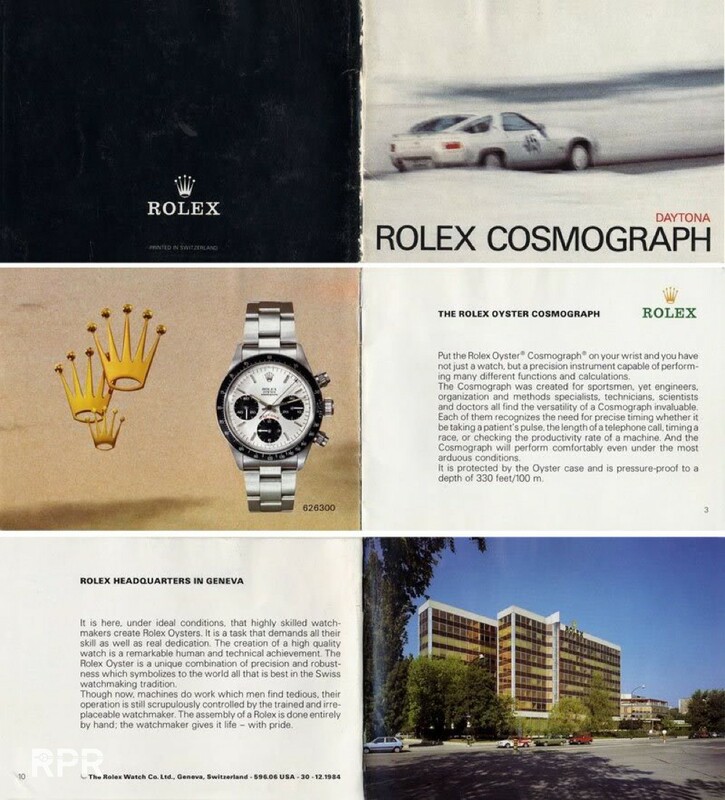 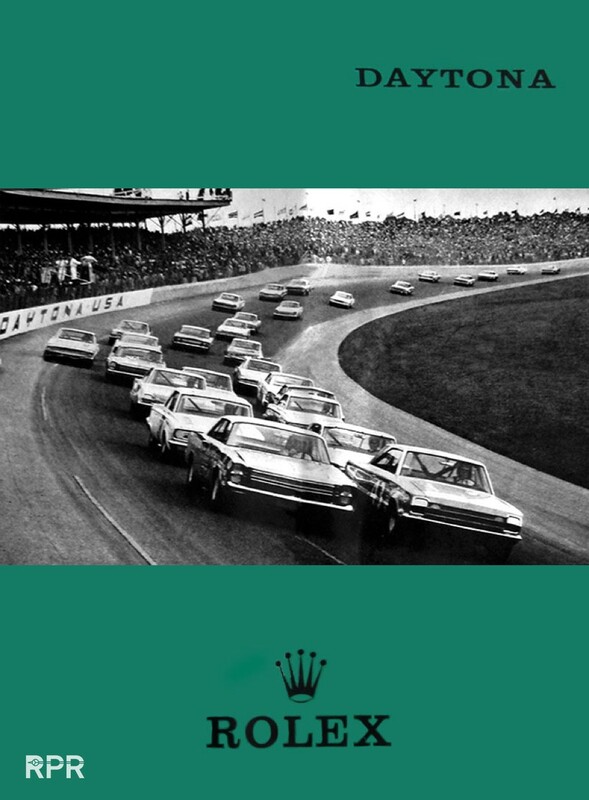 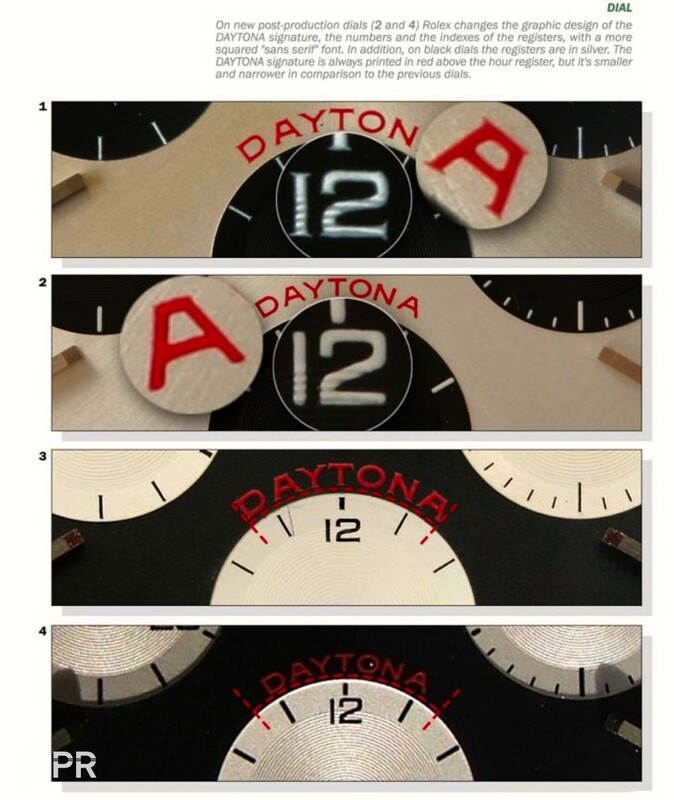 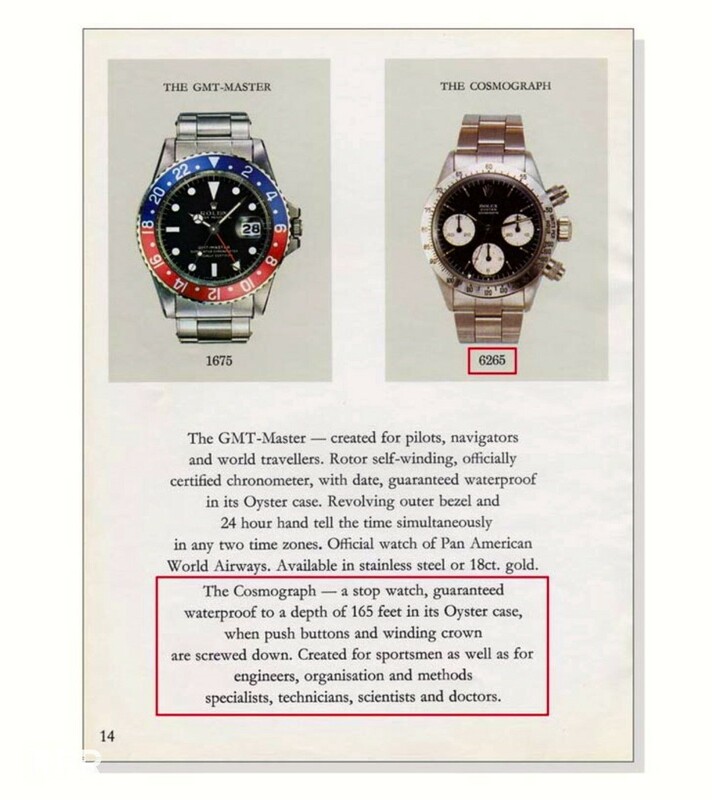 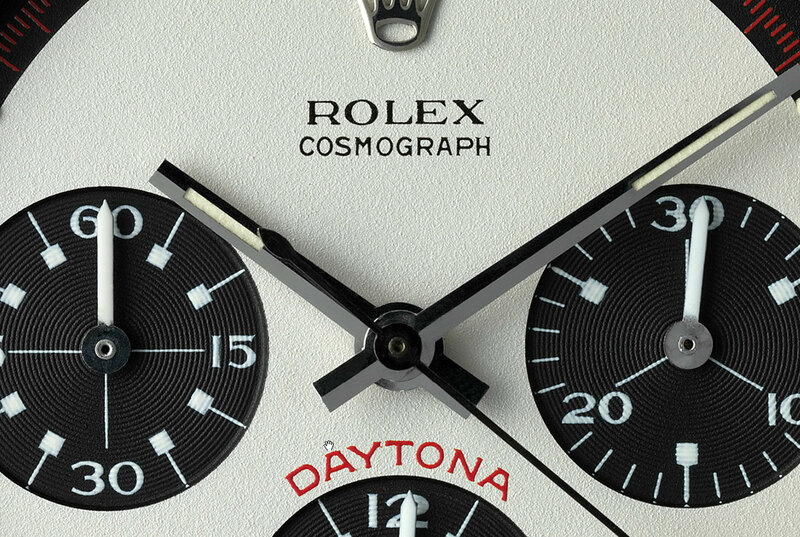 Final Rolex booklet for the Daytona Cosmograph..
With regards to the collection history of Daytona, the moment of “breakthrough” does not arrive until 1988, with the introduction of automatic movements and a rediscovery of manual Daytonas. 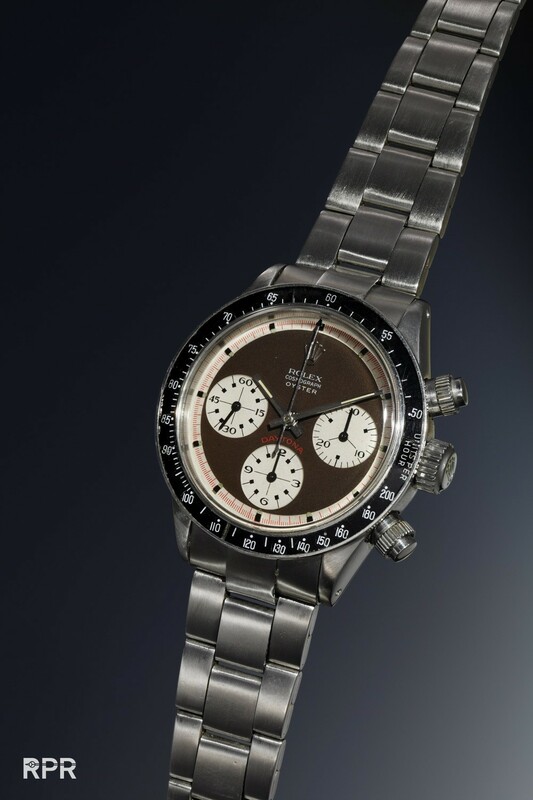 Due to the slow supply from Zenith, the manufacturer of the El Primero caliber, and an underestimation of market demand, retailers find themselves with lines of clients waiting for the delivery of their new watch. 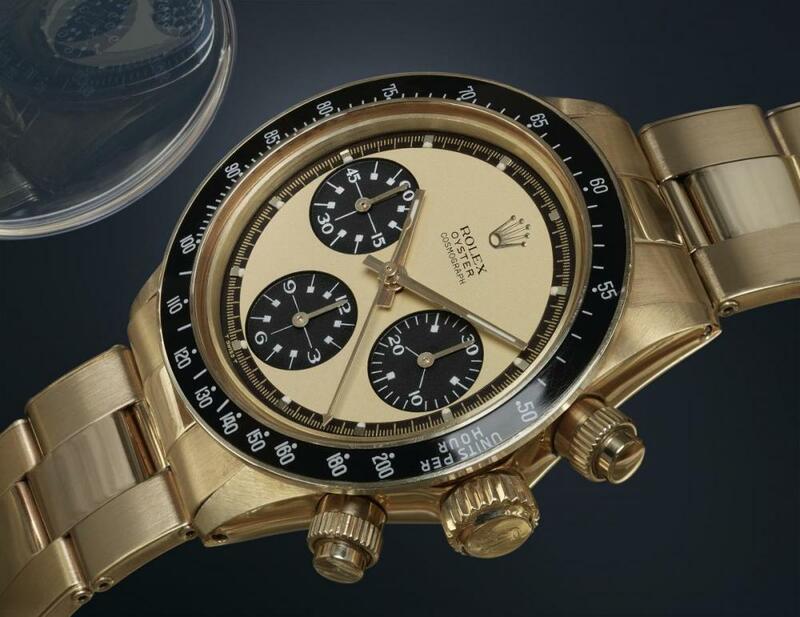 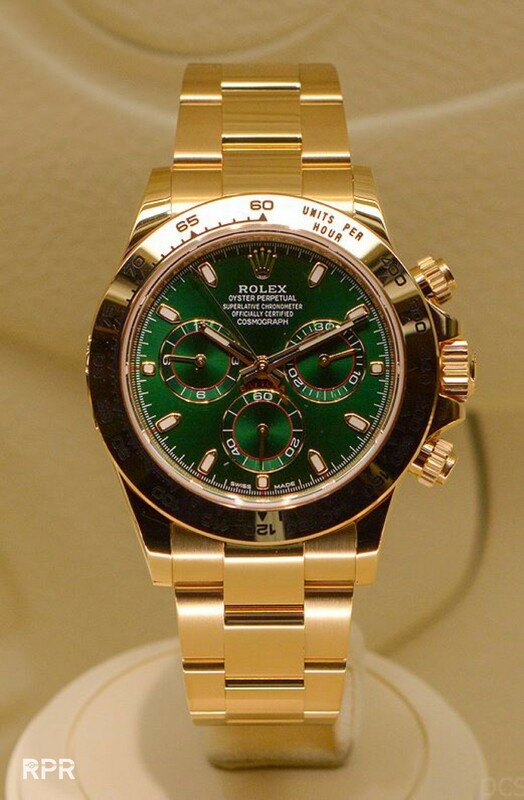 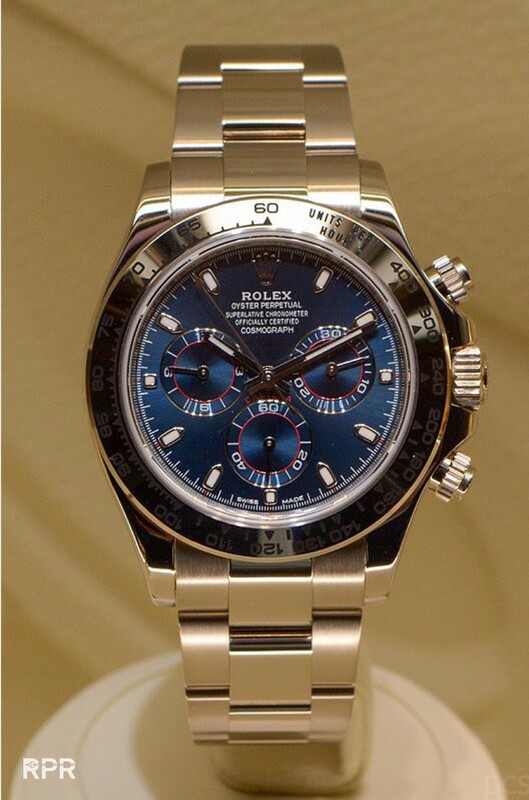 Above, gold Ying & Yang early automatic Daytona. 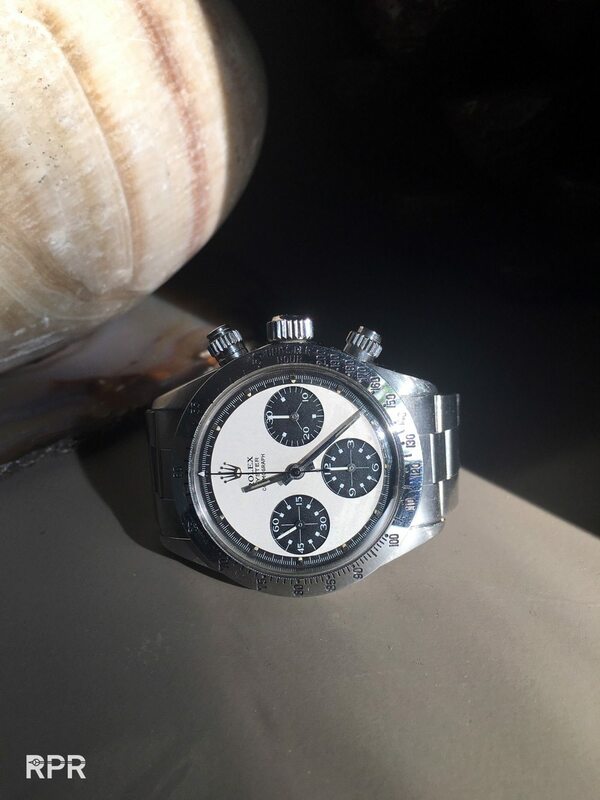 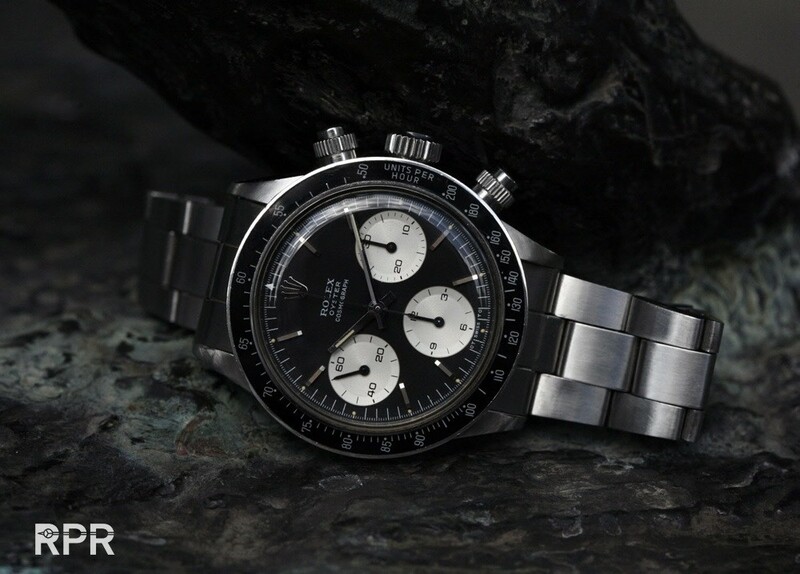 Early porcelain Steel Daytona that has been made in small quantity and due to high costs and difficulties of producing. 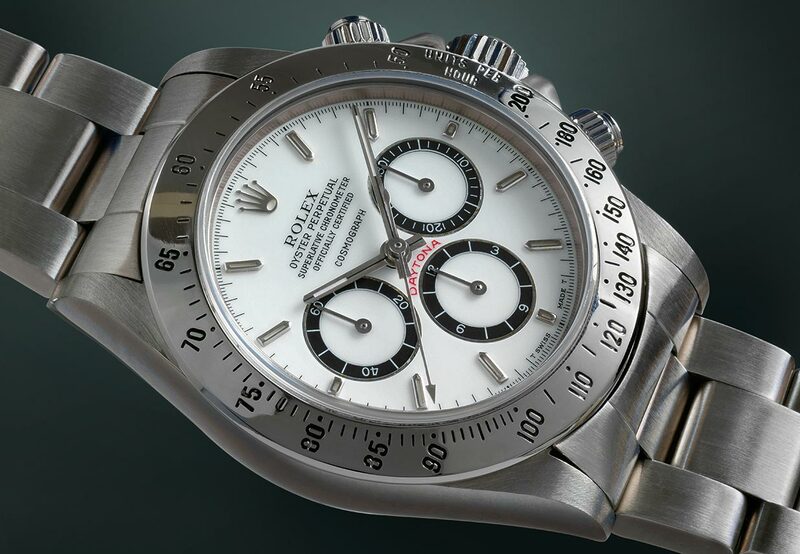 The updated Rolex Ref 116520, now with silver colored sub dials. 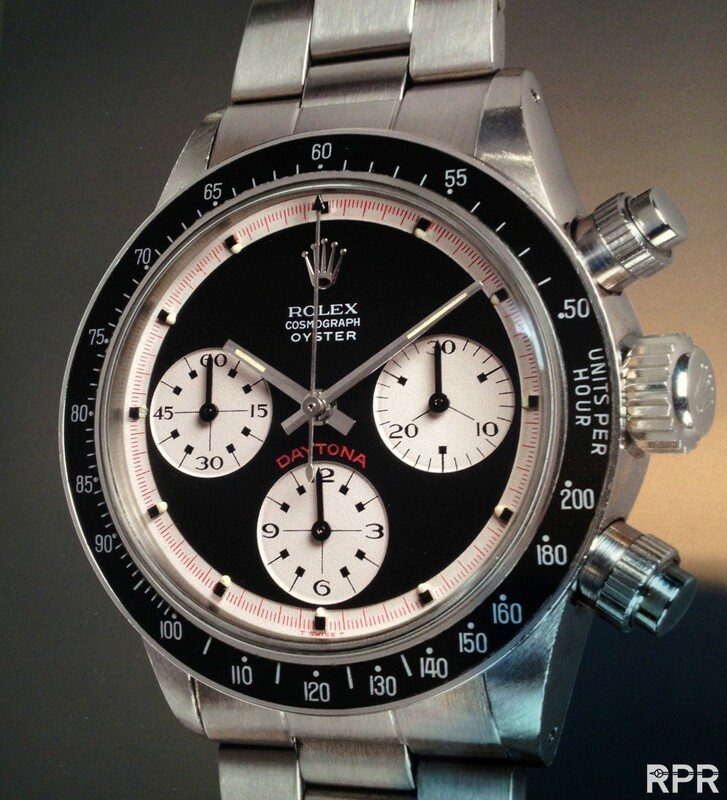 In detail, the new Ref 1165oo LN, again with black colored sub dials. 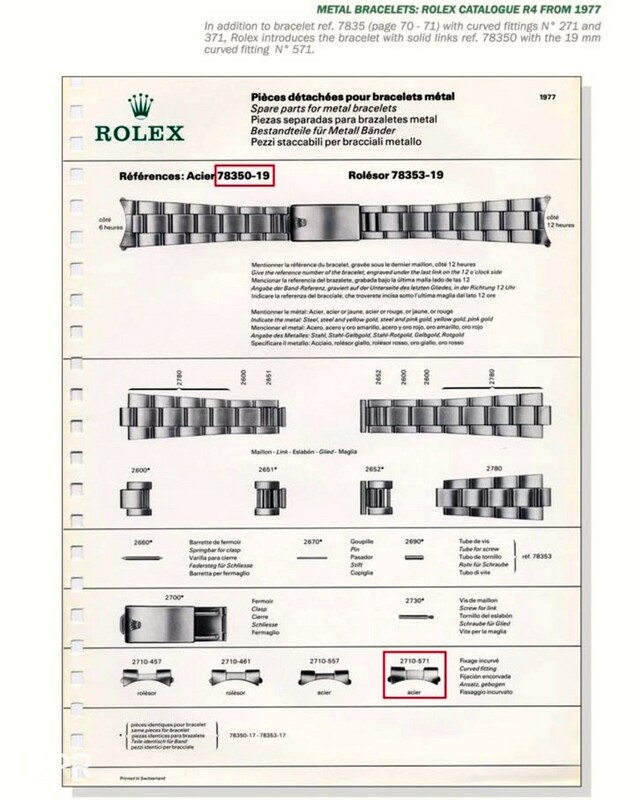 A hint to it’s iconic Rolex heritage! 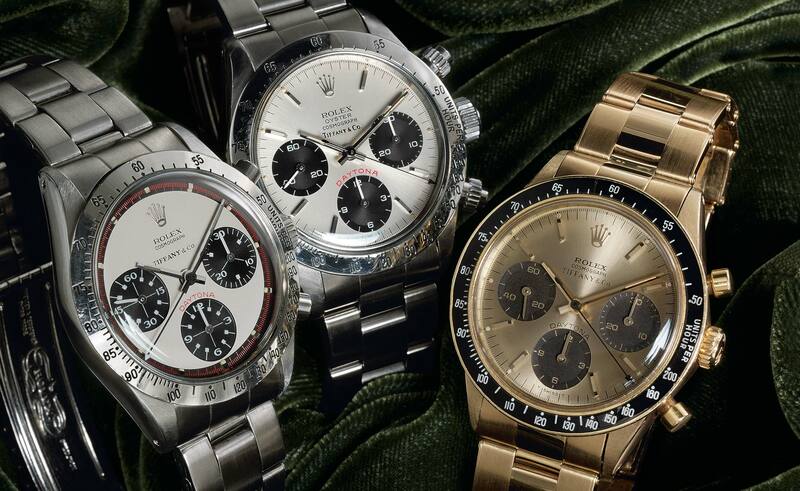 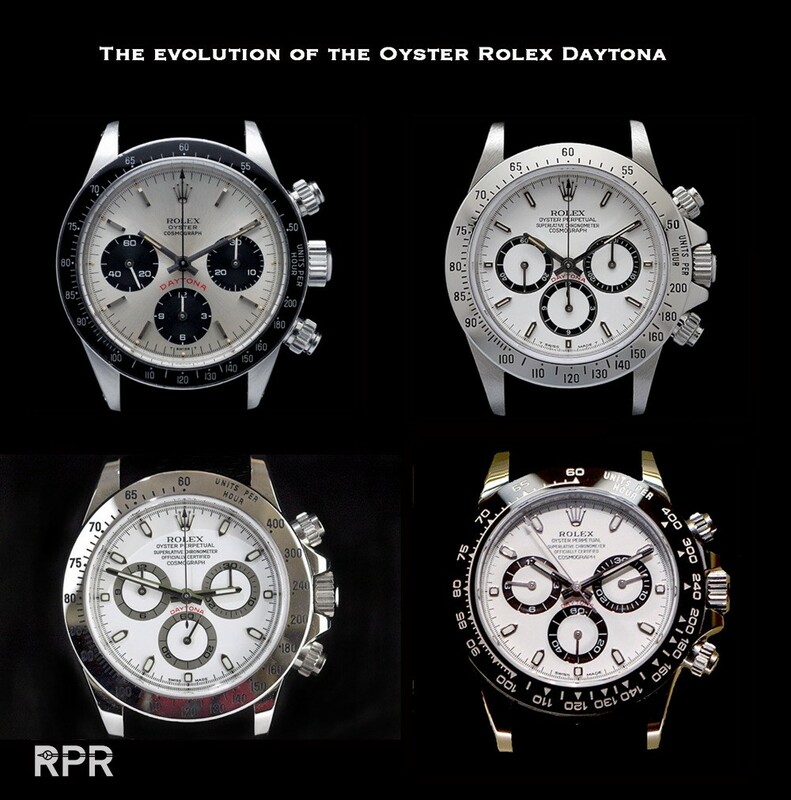 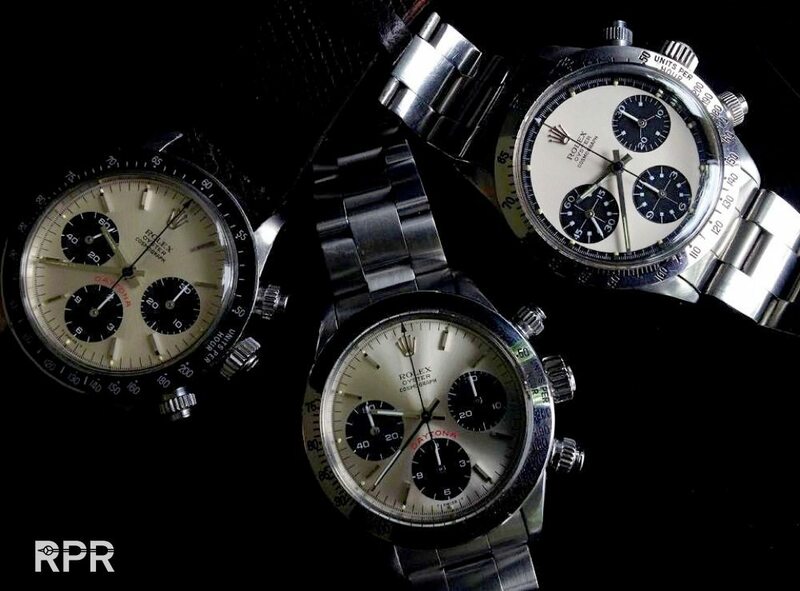 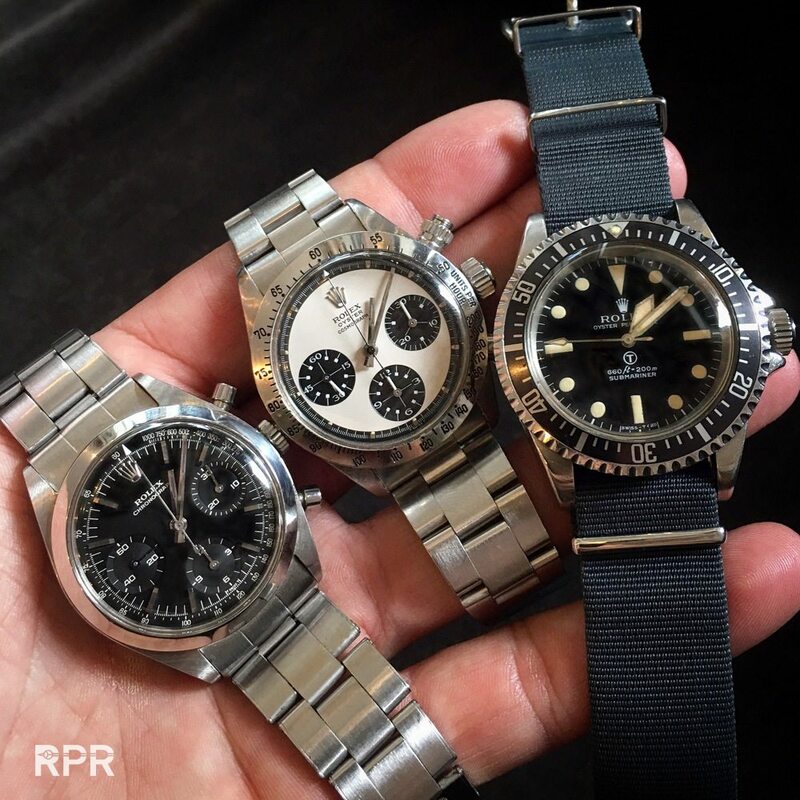 Rolex introduced during the 2016 BaselWorld show their new steel Oyster Rolex Daytona Cosmograph, read about it on RPR..
Let me end with the evolution of the Oyster Rolex Daytona from ref 6263, 16520 to Ref 116520 to the latest Ref 1165oo LN.. 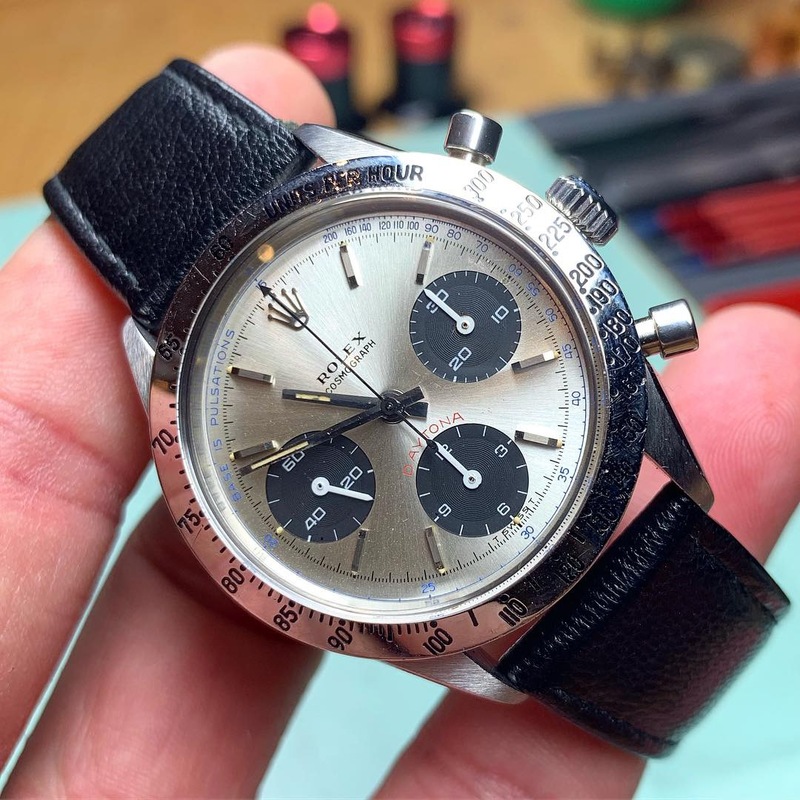 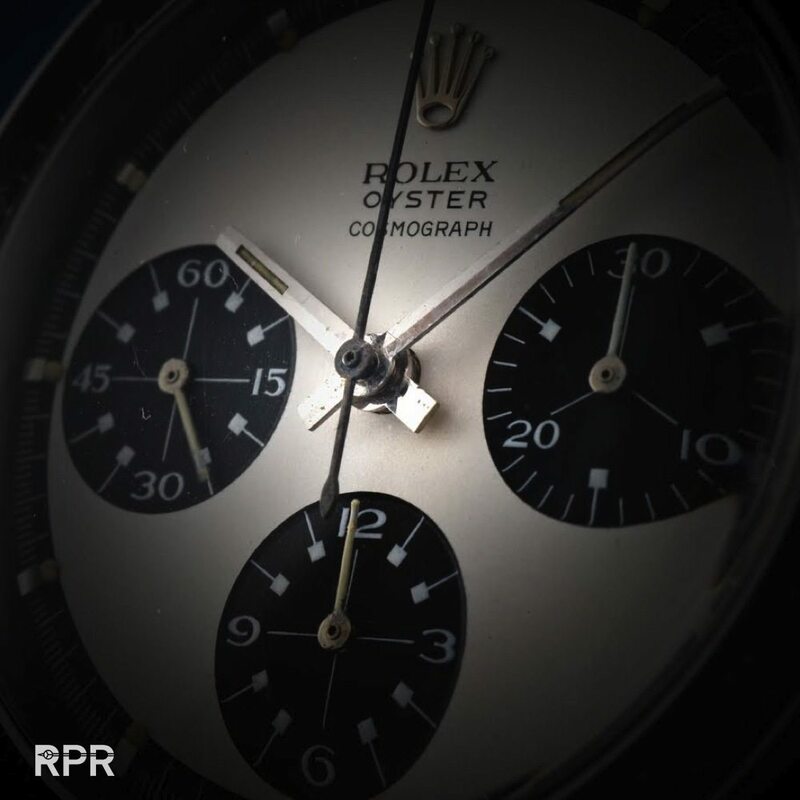 If you have any question or you perhaps own a early Rolex Daytona and you want to know more about your watch, contact me by using the CONTACT Button. 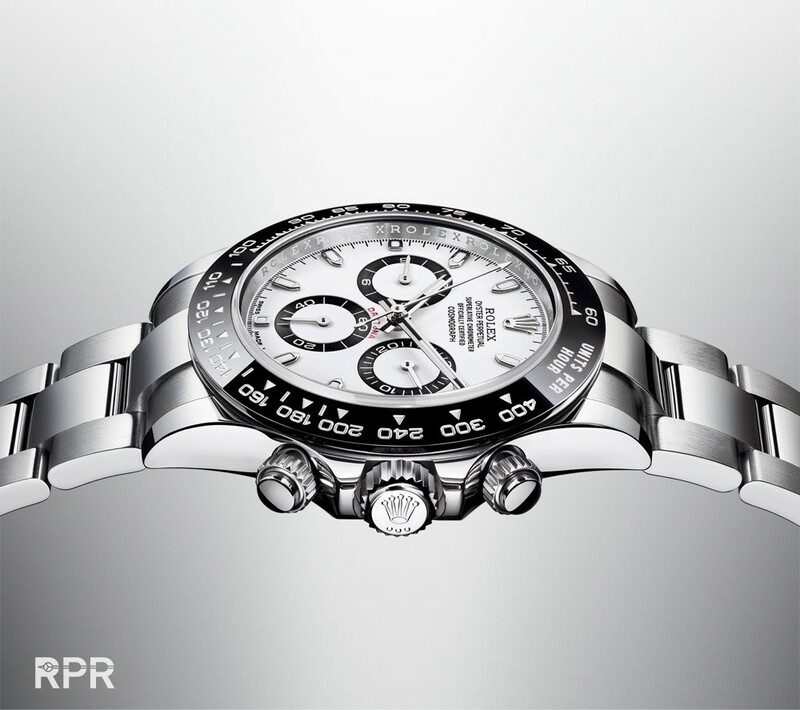 I do hope you have enjoyed this RPReport! 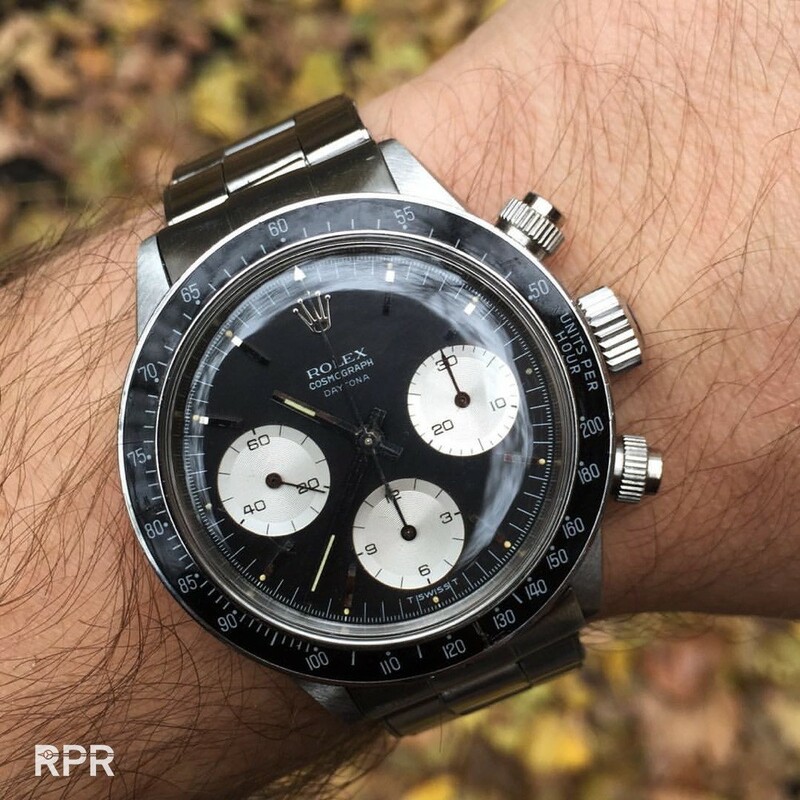 This post was written by Philipp on January 17, 2017.